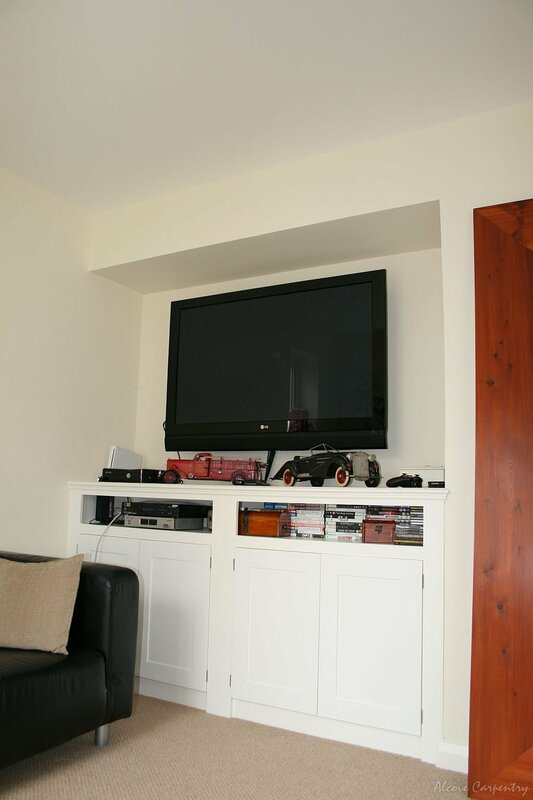 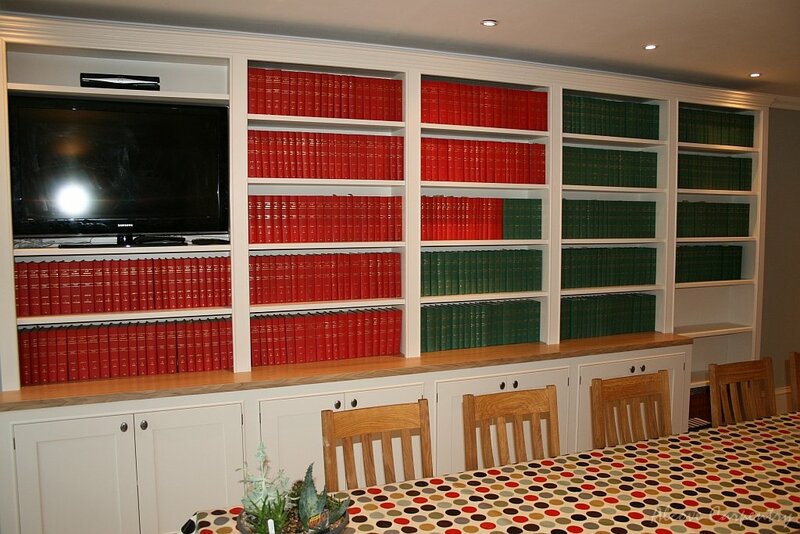 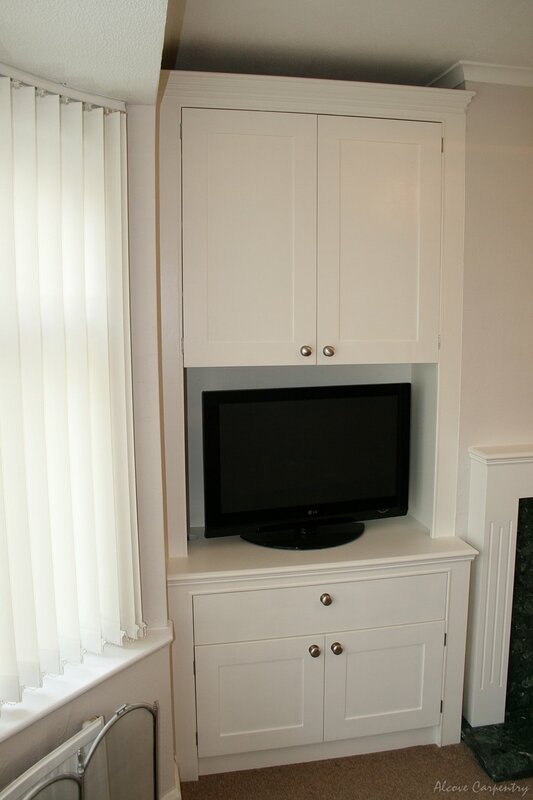 We offer a range of built-in furniture. 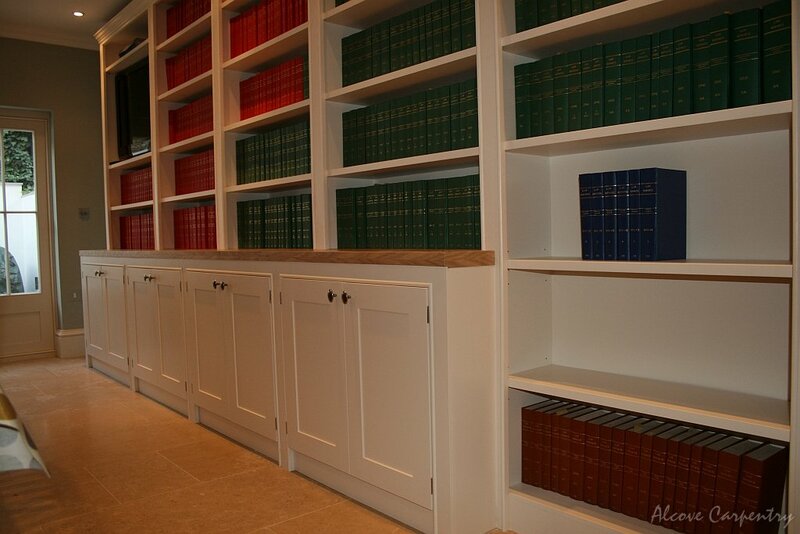 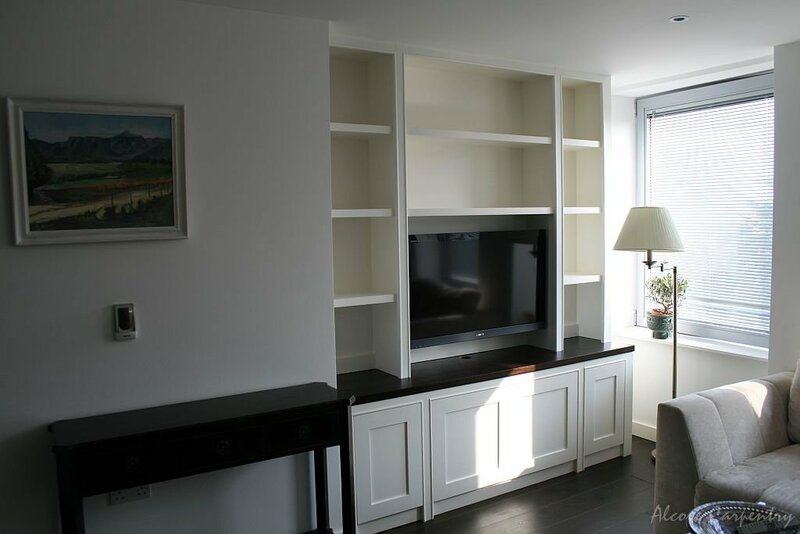 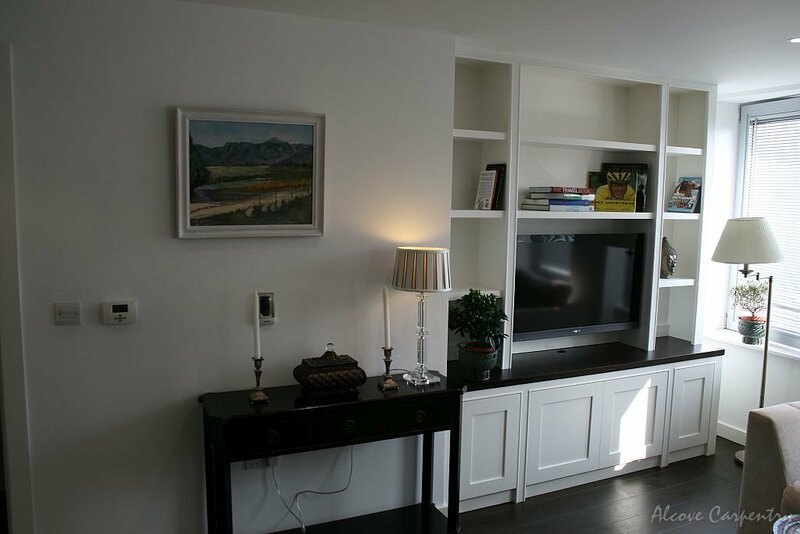 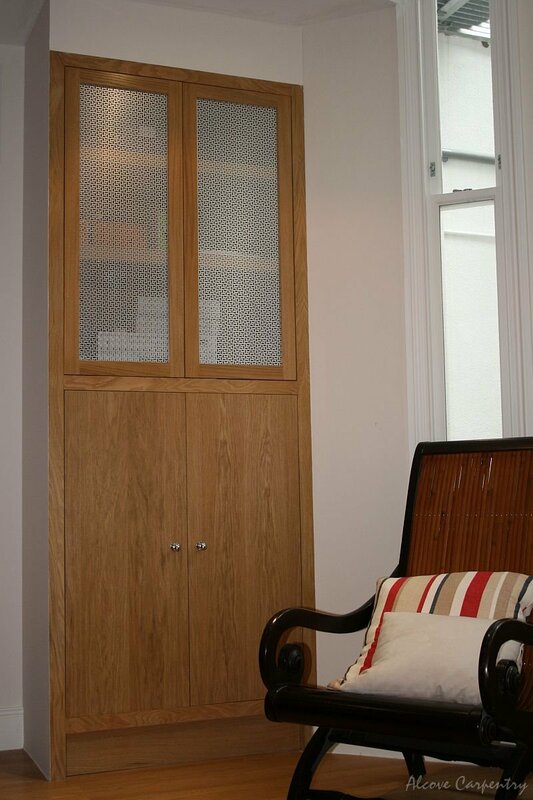 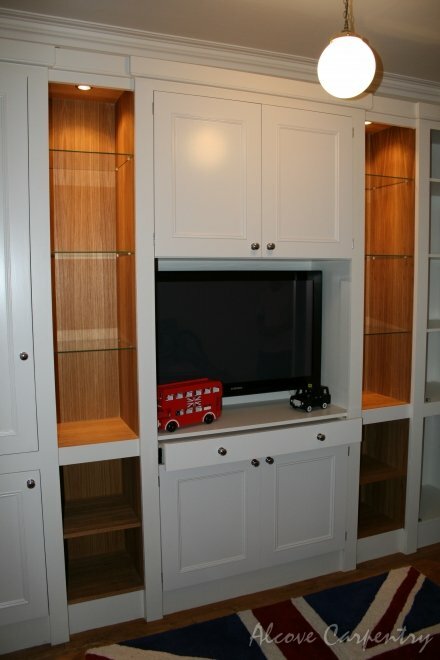 The alcove cabinets are the most popular solution for living space. 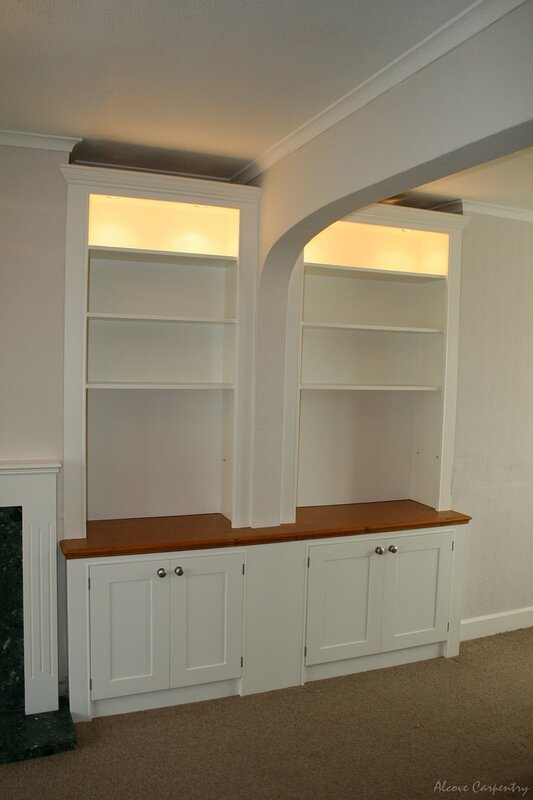 The alcove cabinets can have spacious shelves for displaying ornaments, sculptures and handy storage cabinets with drawers. 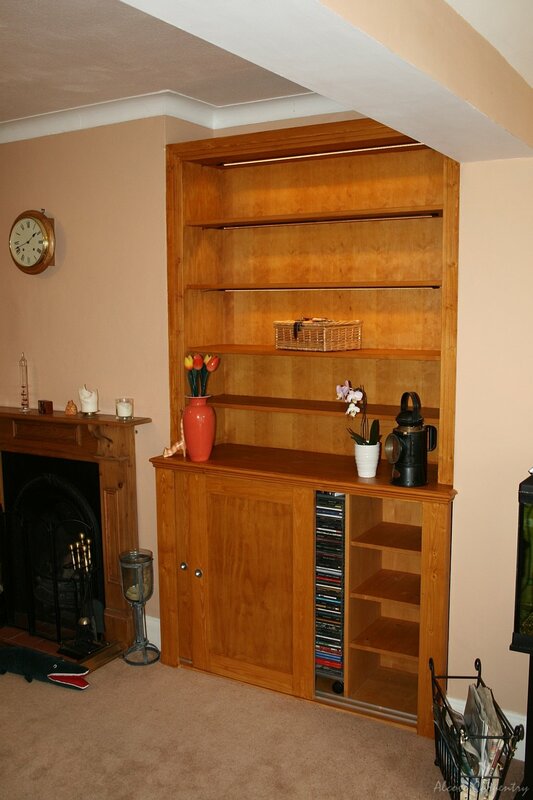 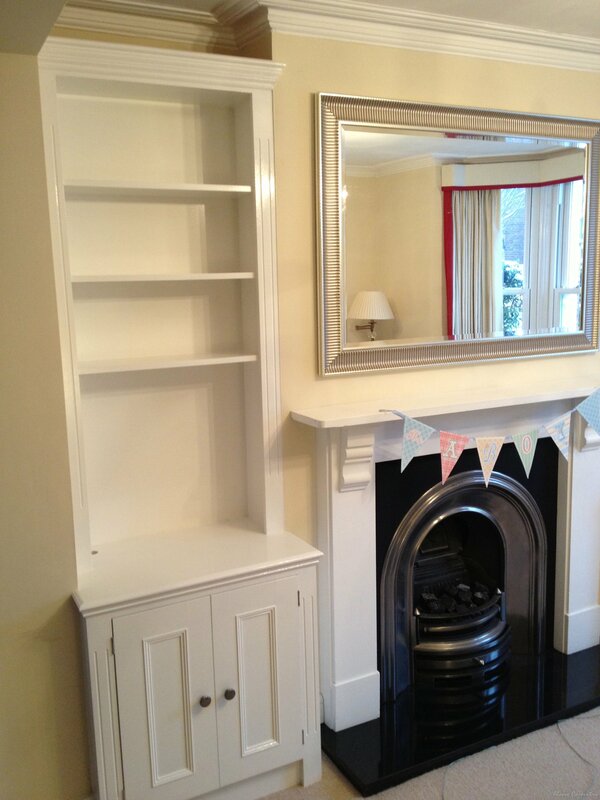 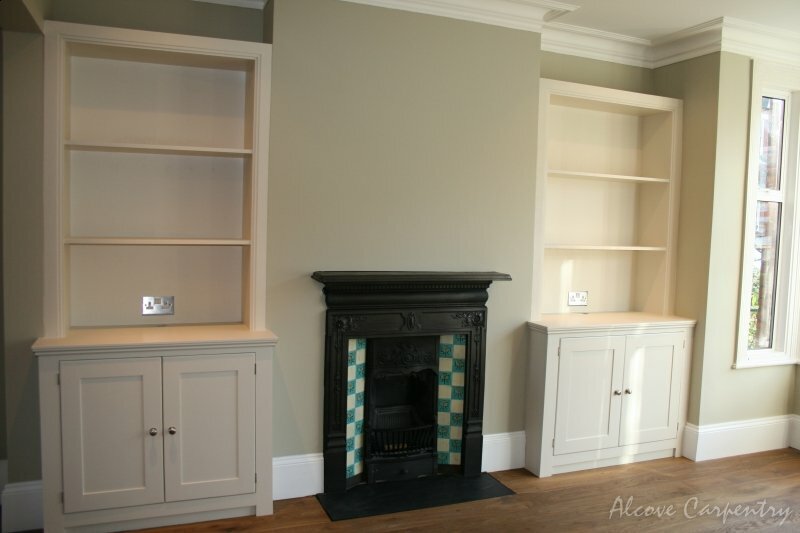 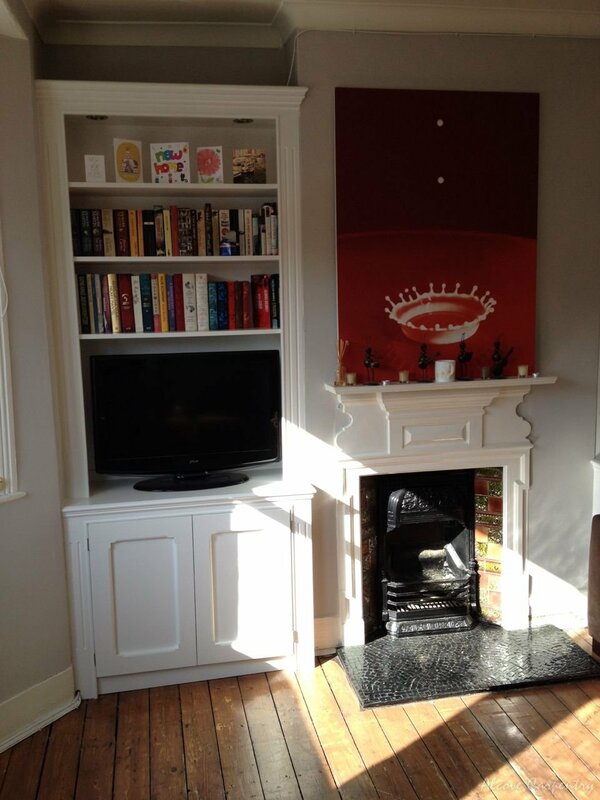 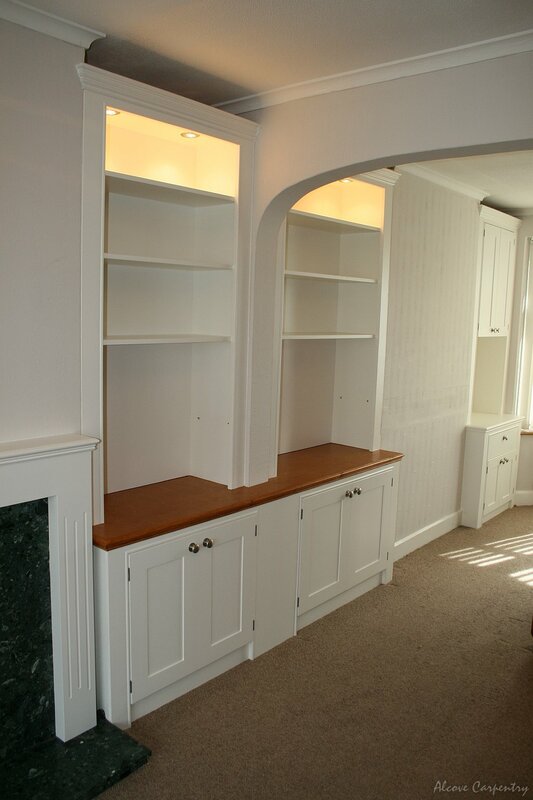 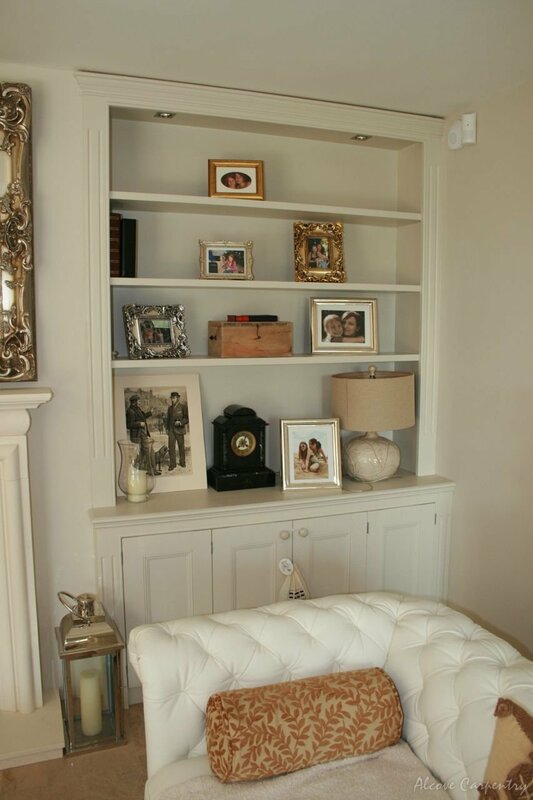 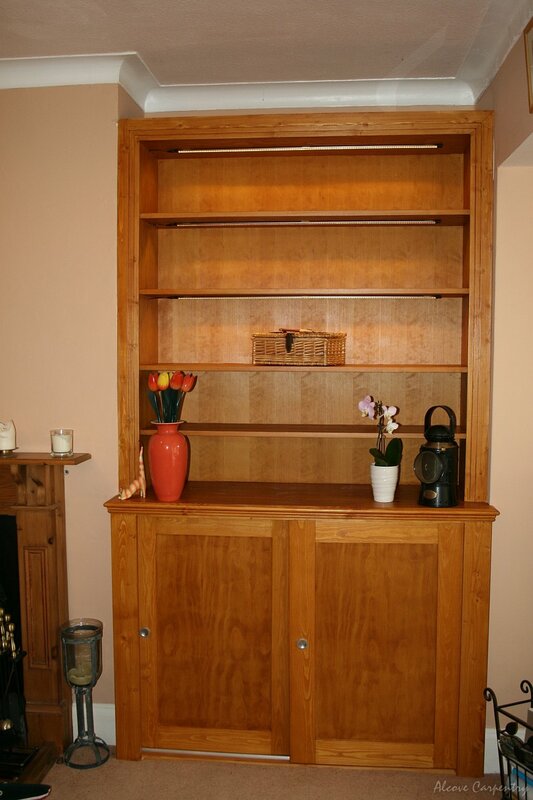 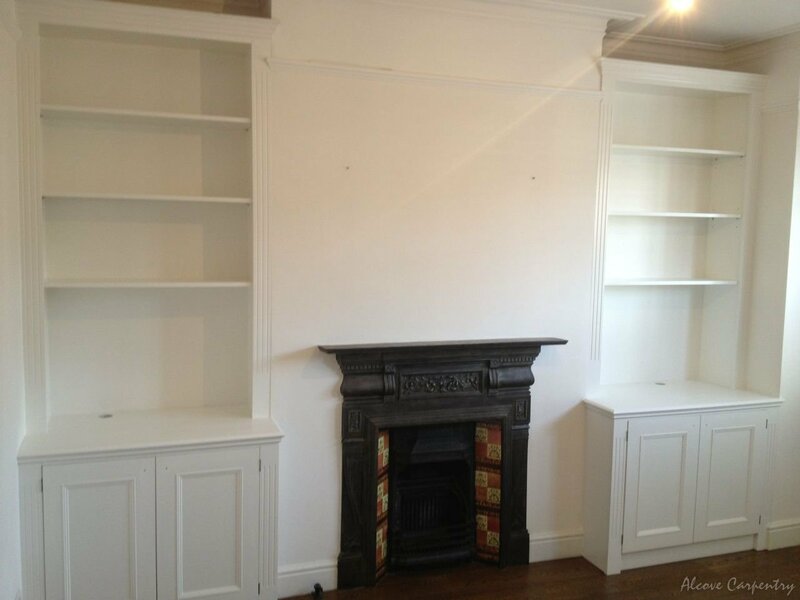 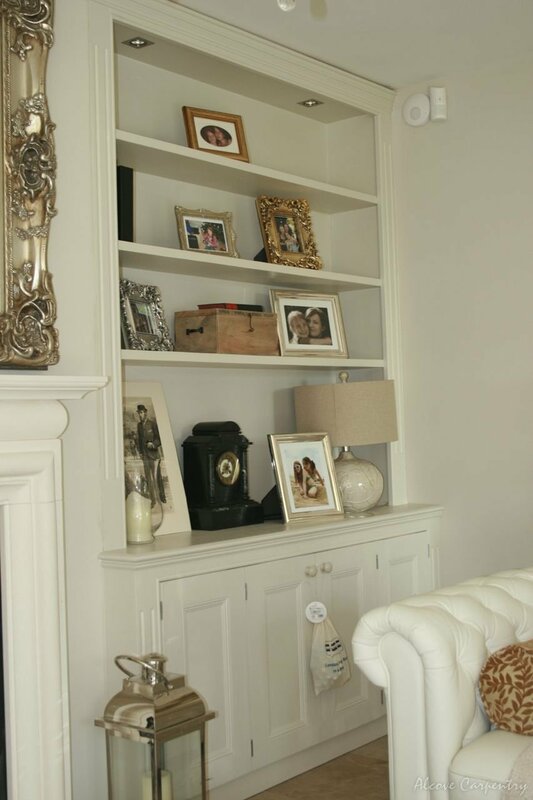 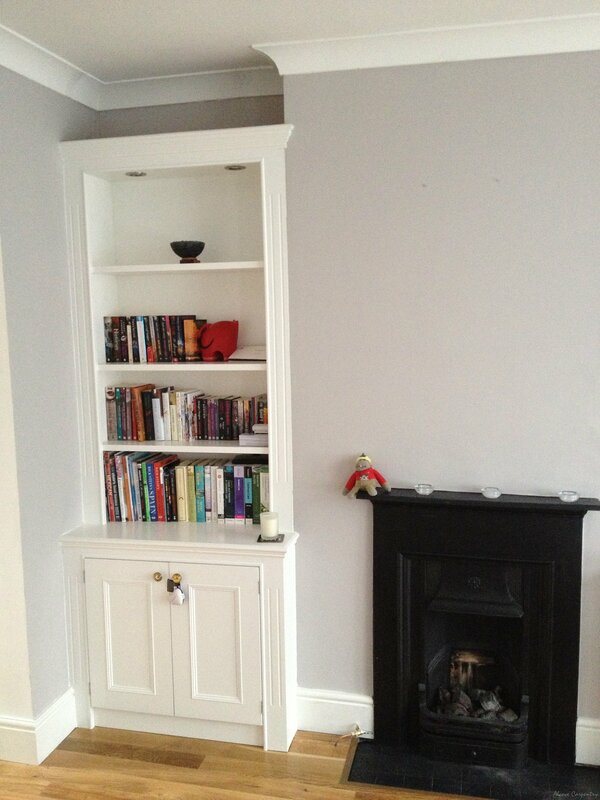 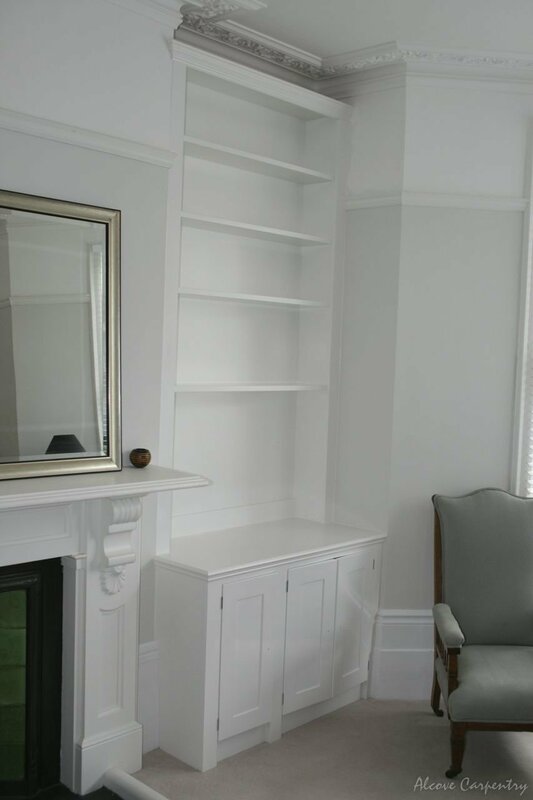 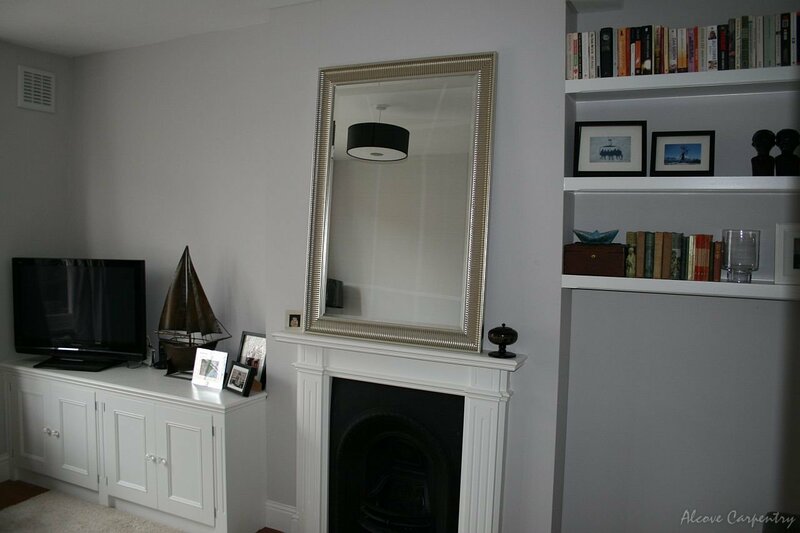 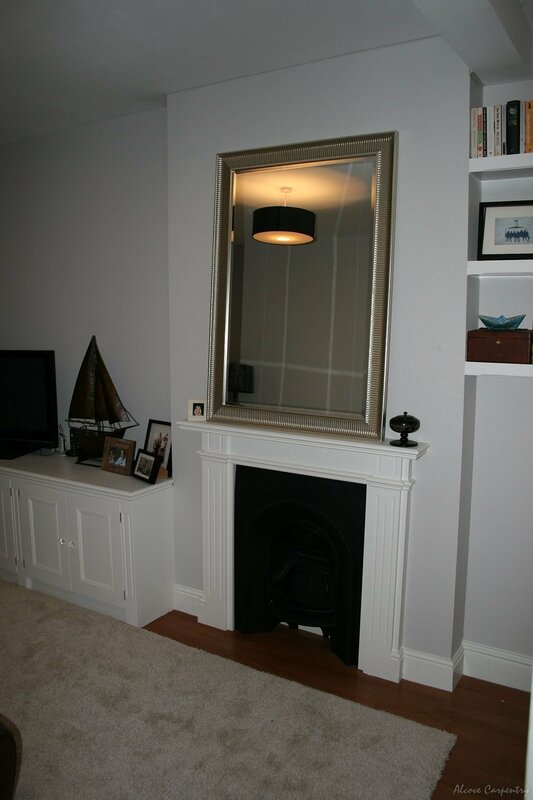 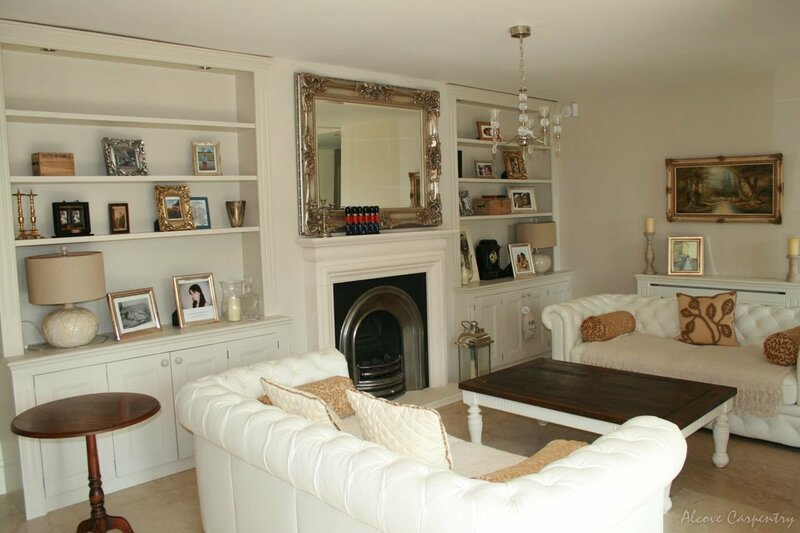 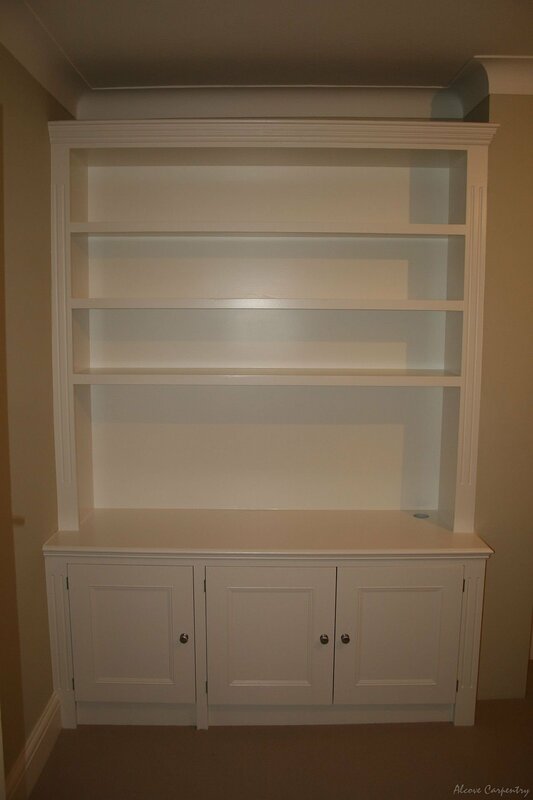 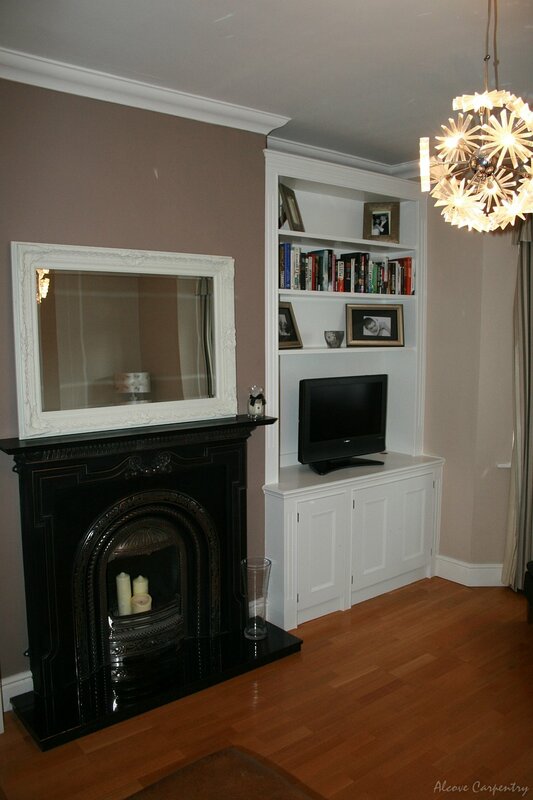 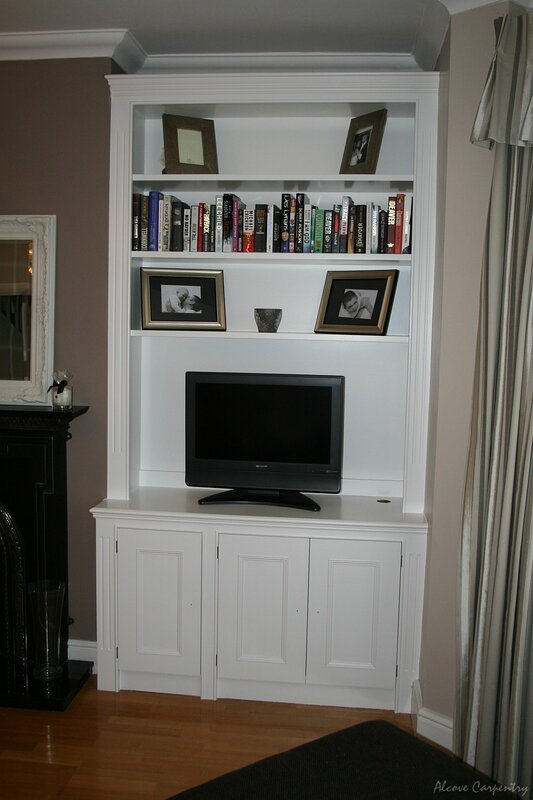 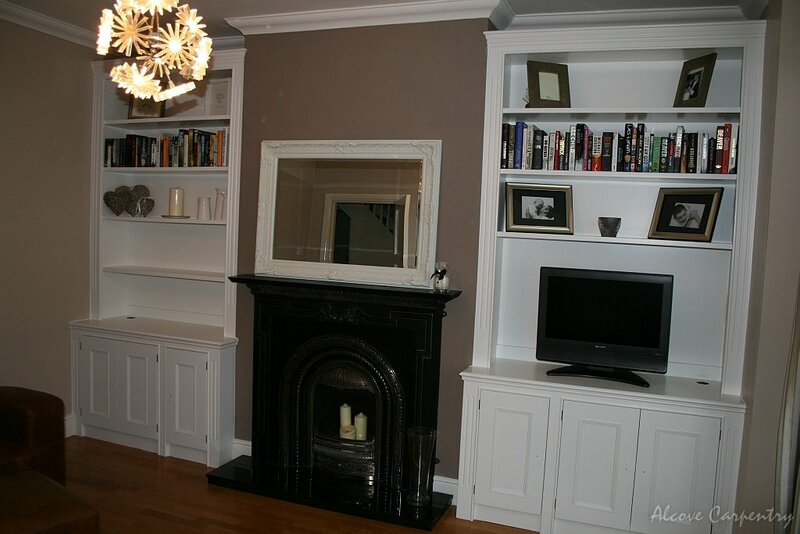 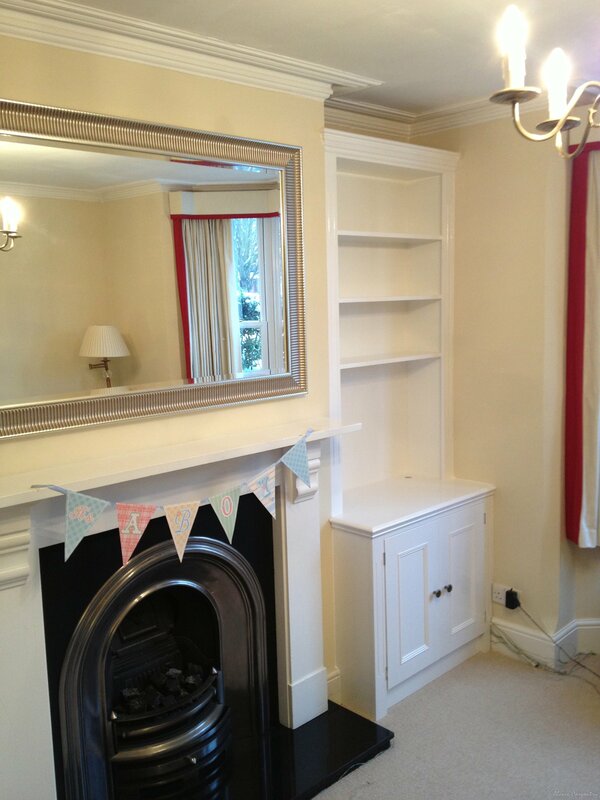 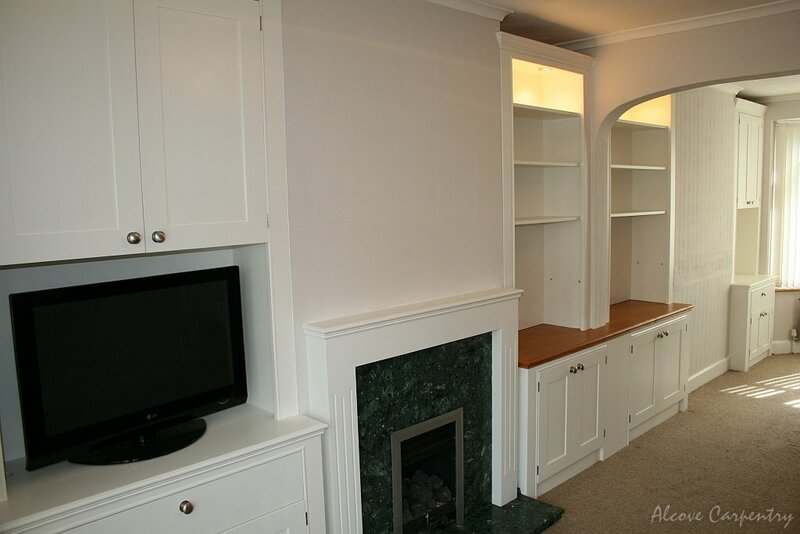 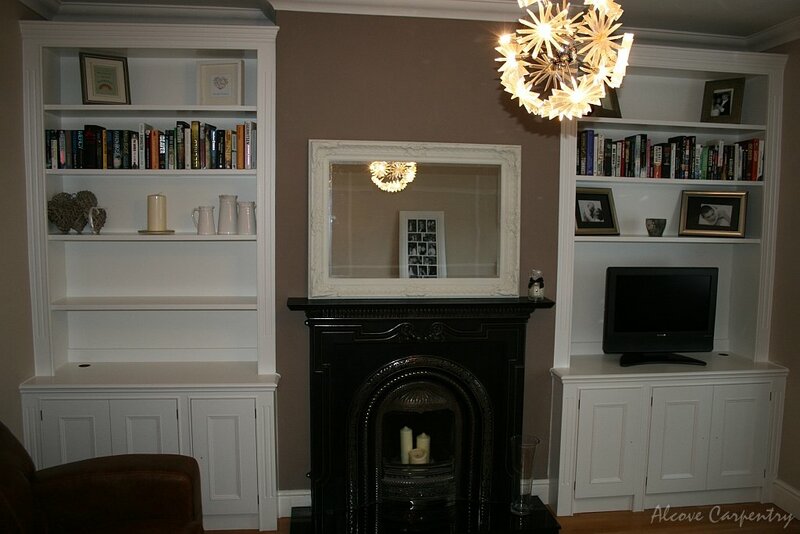 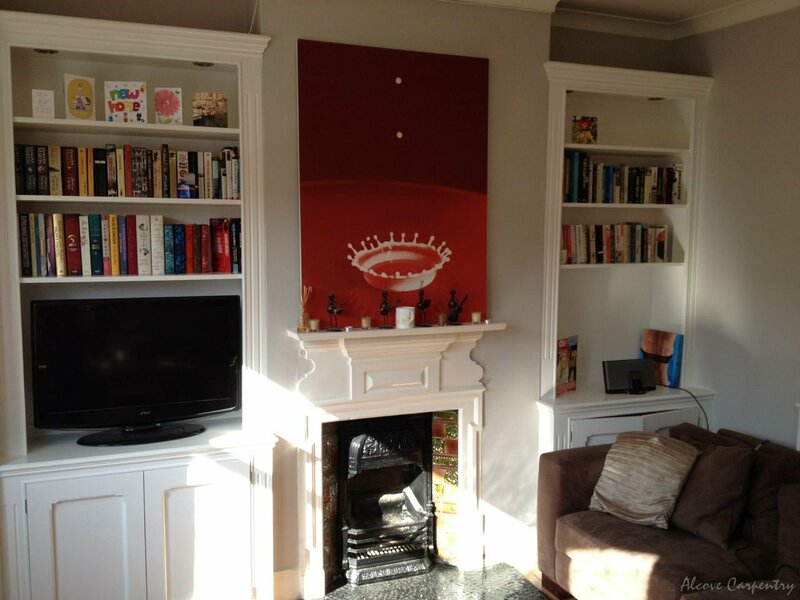 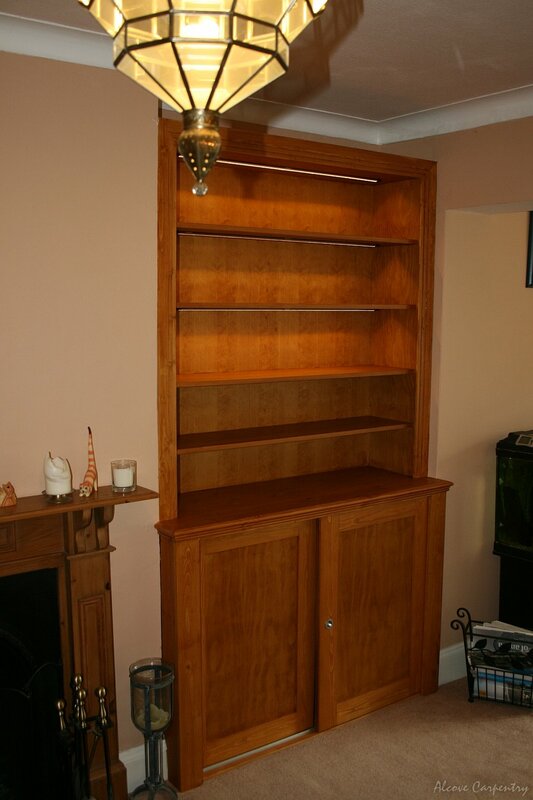 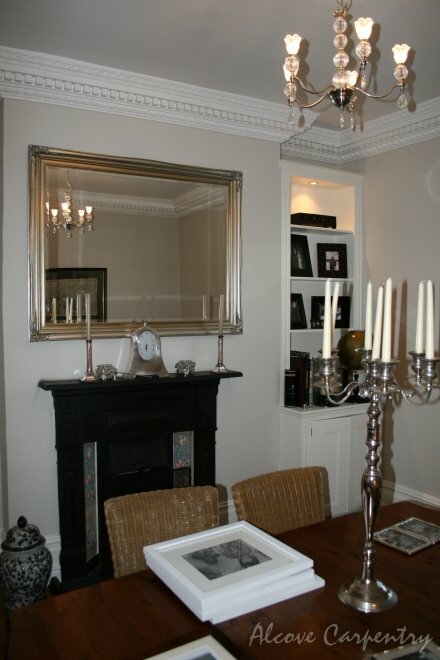 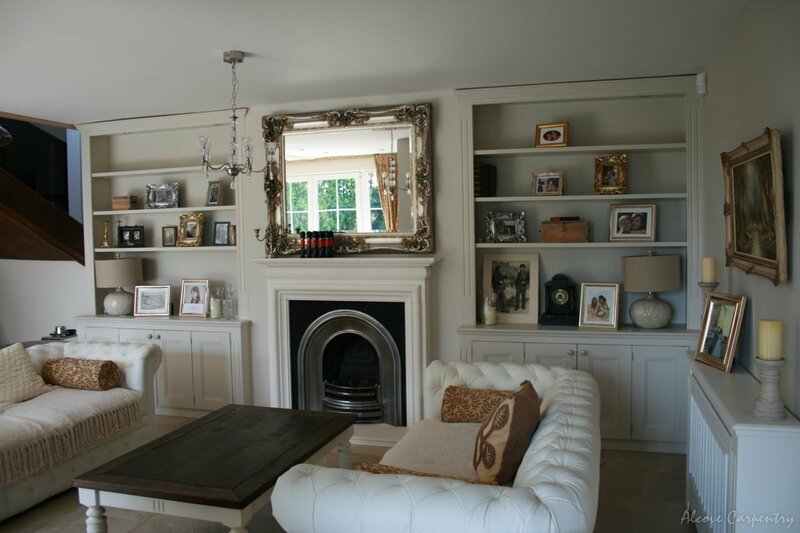 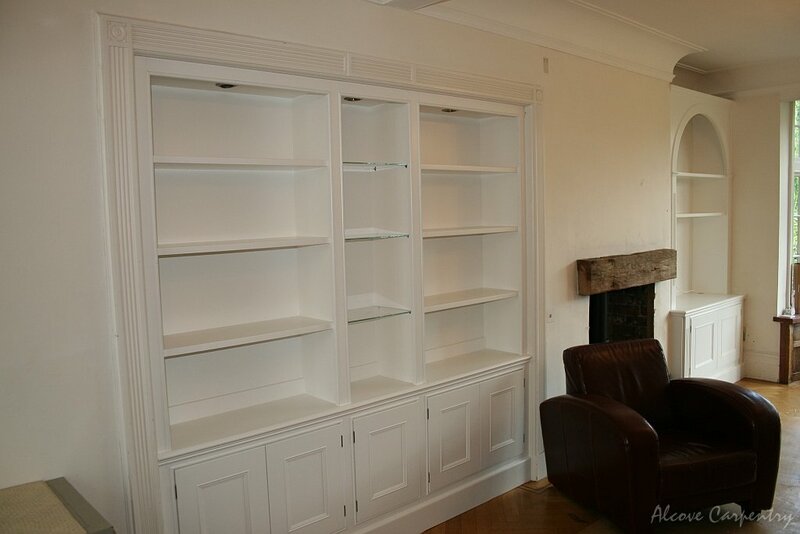 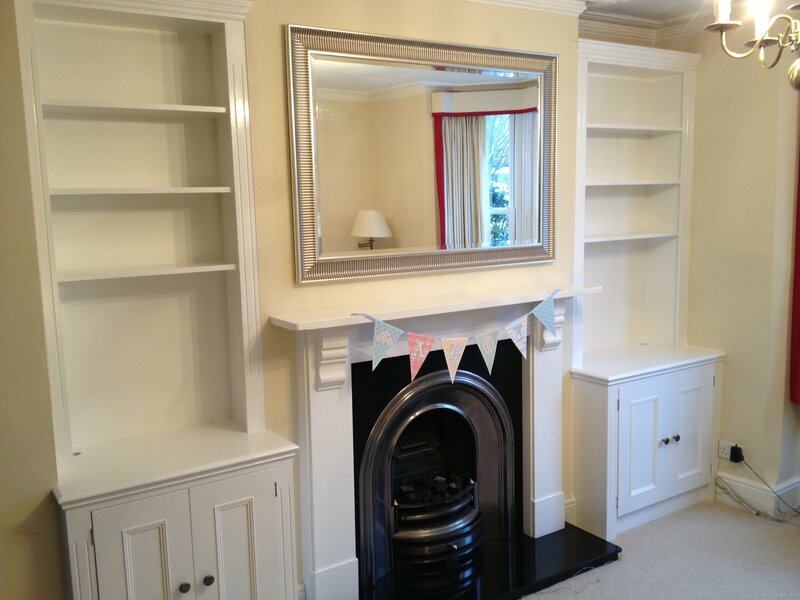 This will make alcove furniture a key item of your living and dinning room. 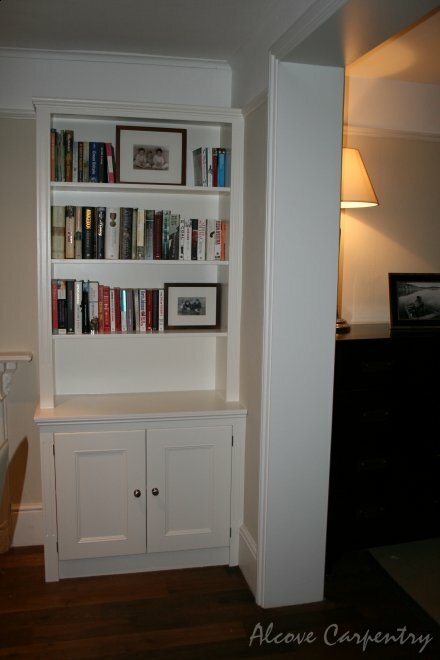 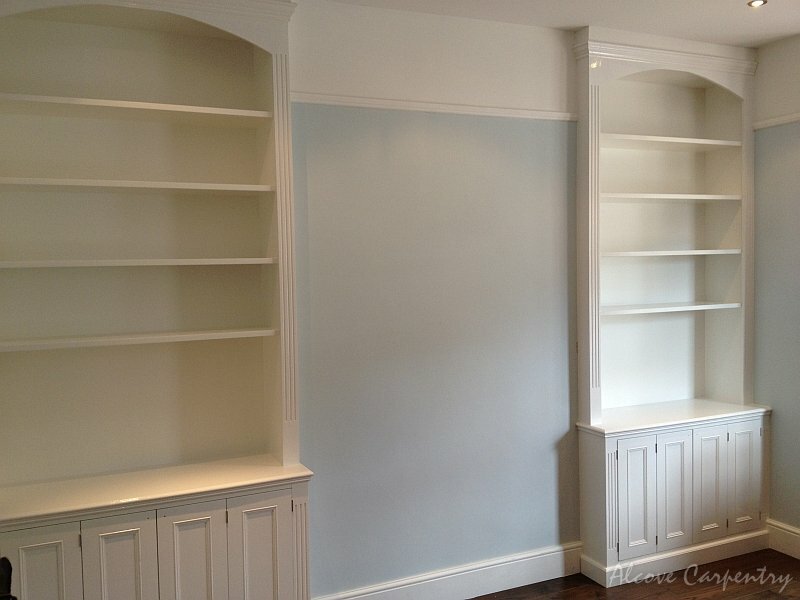 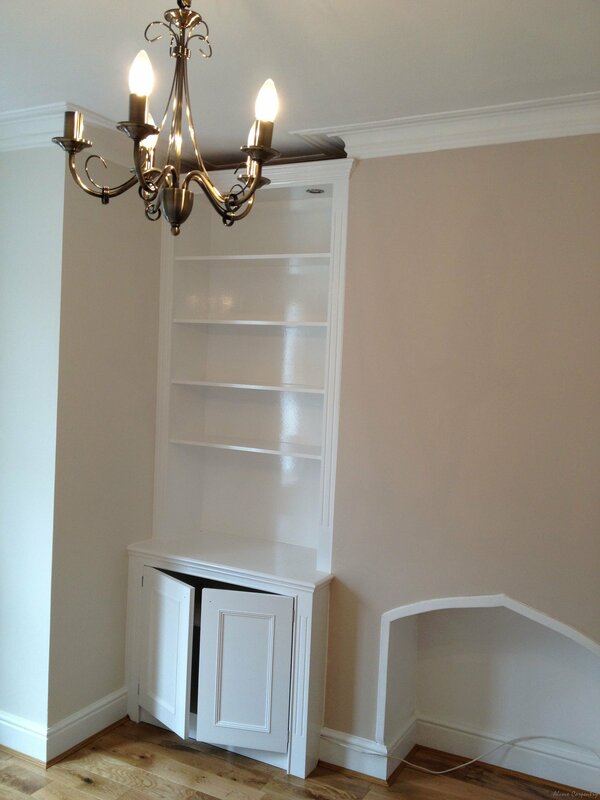 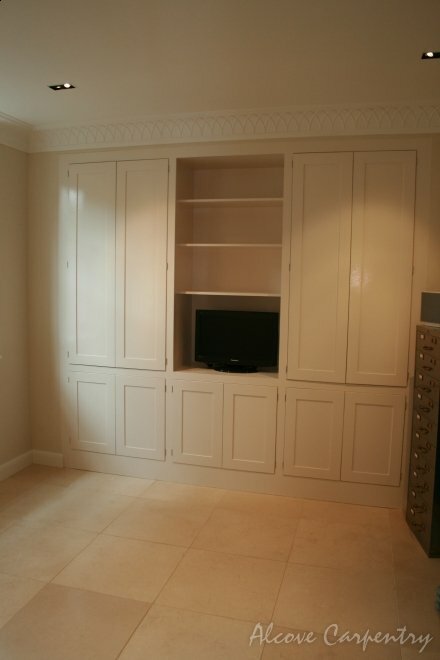 Alcove furniture is installed into room niches as part of the wall. 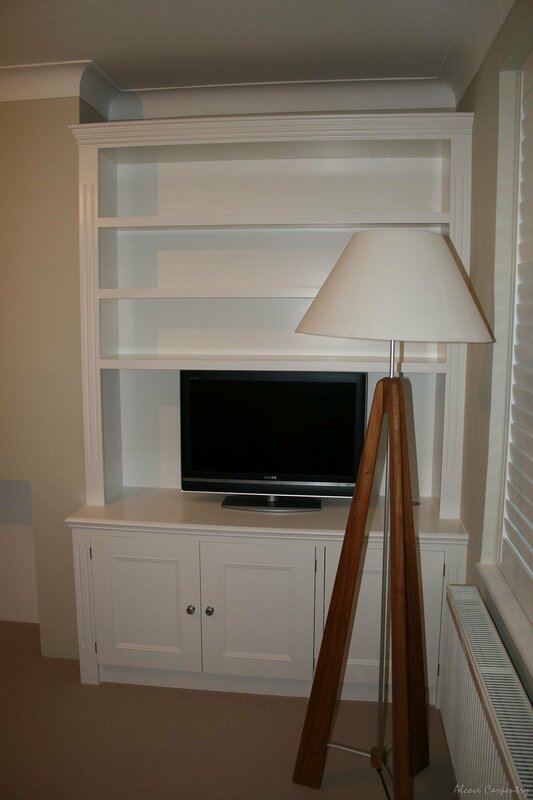 We design them to match the room style, becoming the decorative house fixtures. 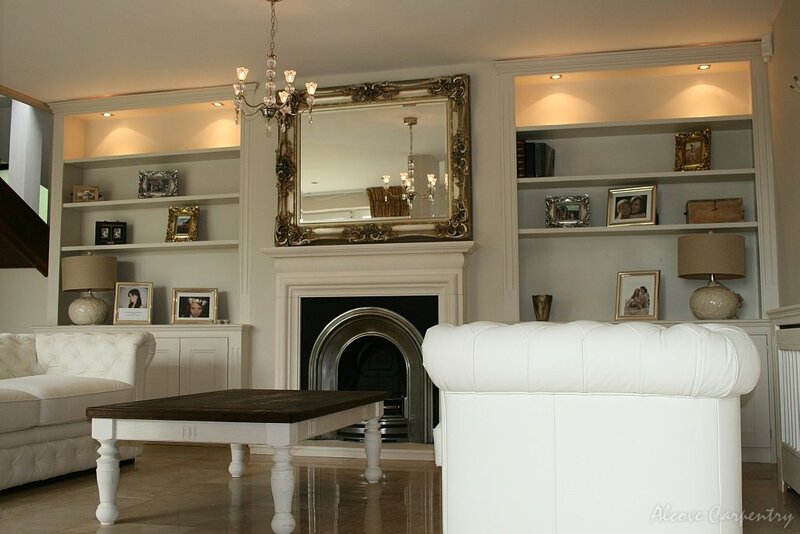 They give an elegant look, stylish and timeless charm. 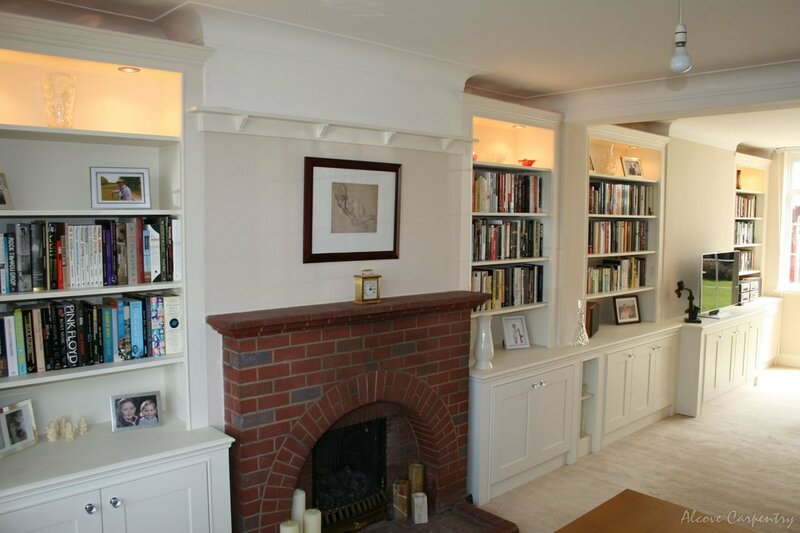 We suggest neat, well-balanced, natural lines to reveal beauty of your houses. 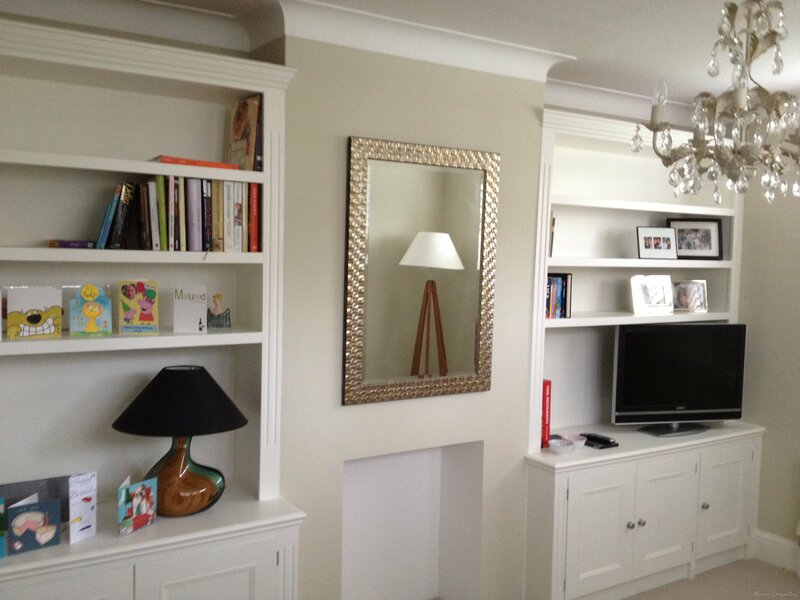 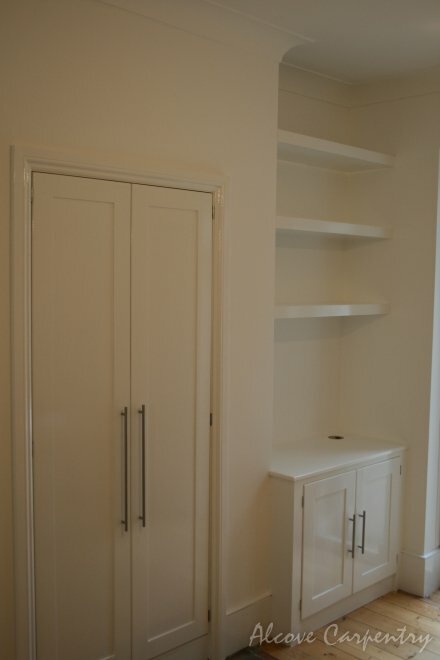 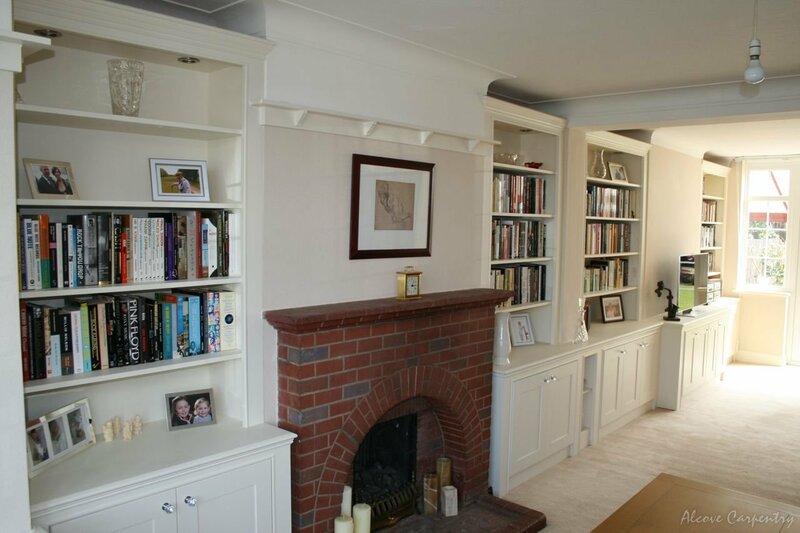 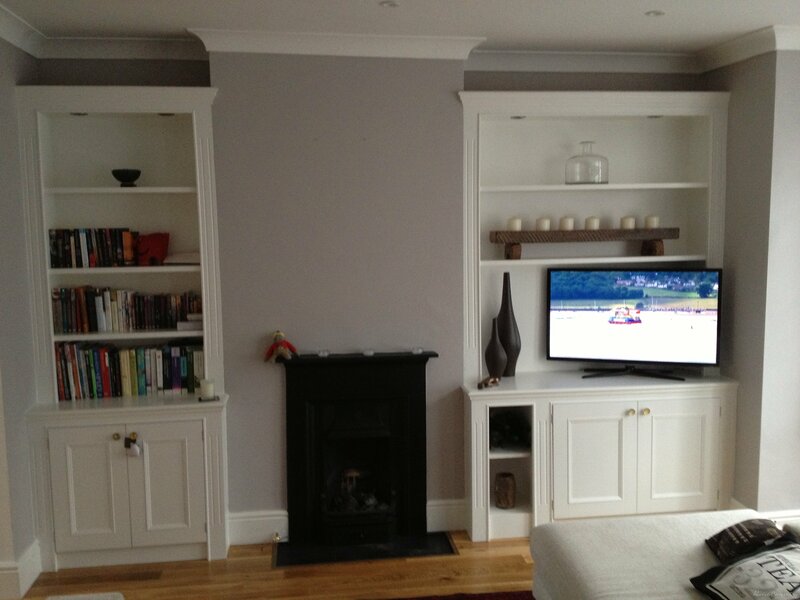 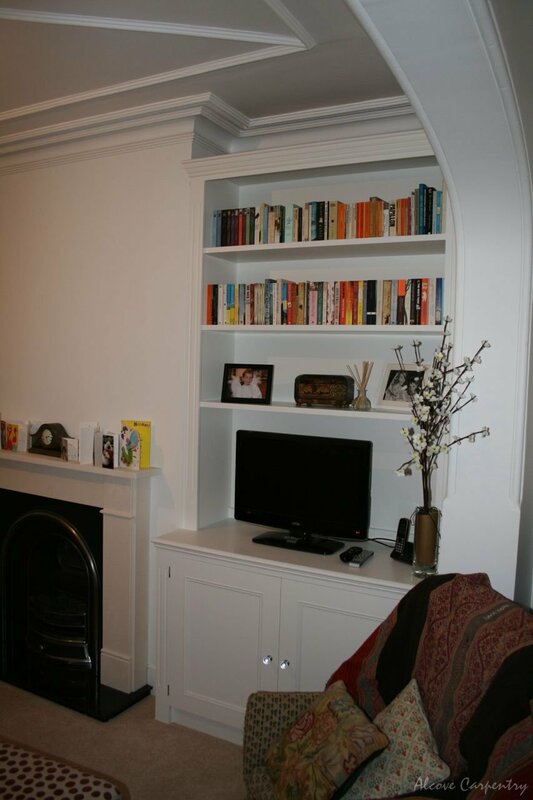 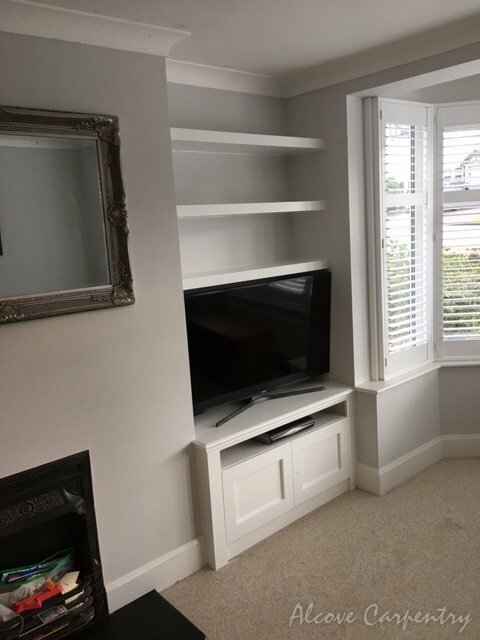 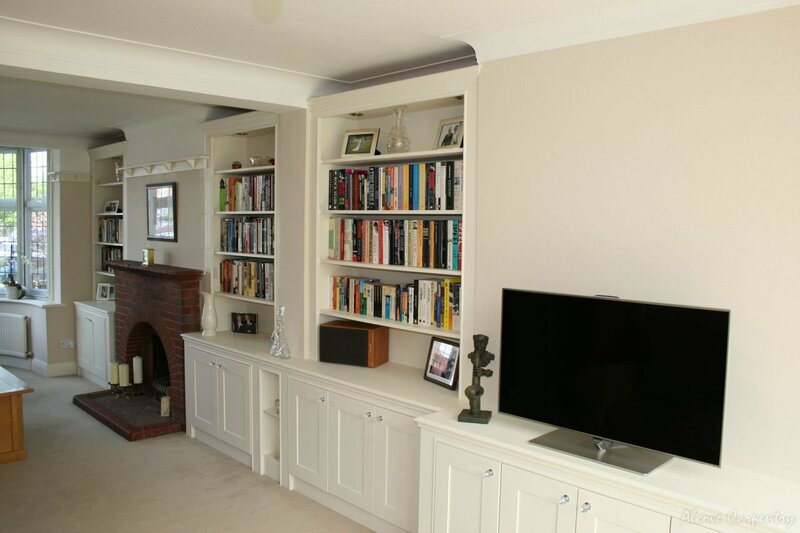 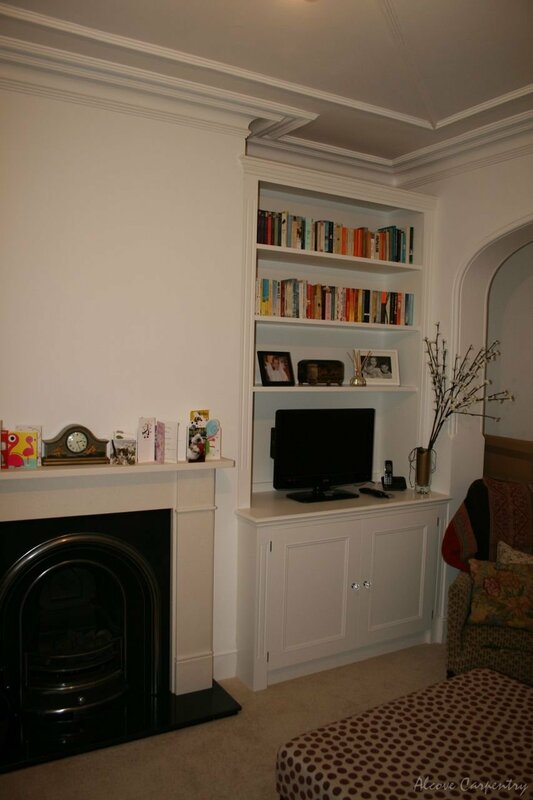 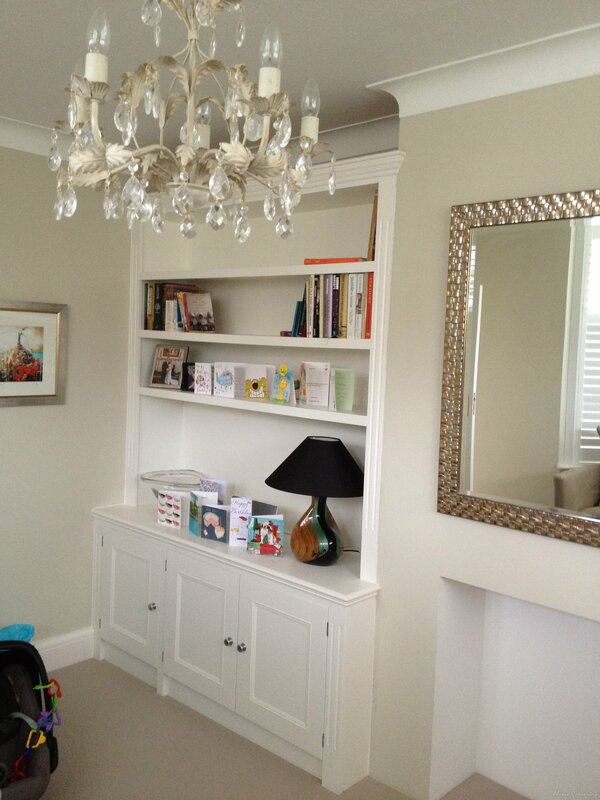 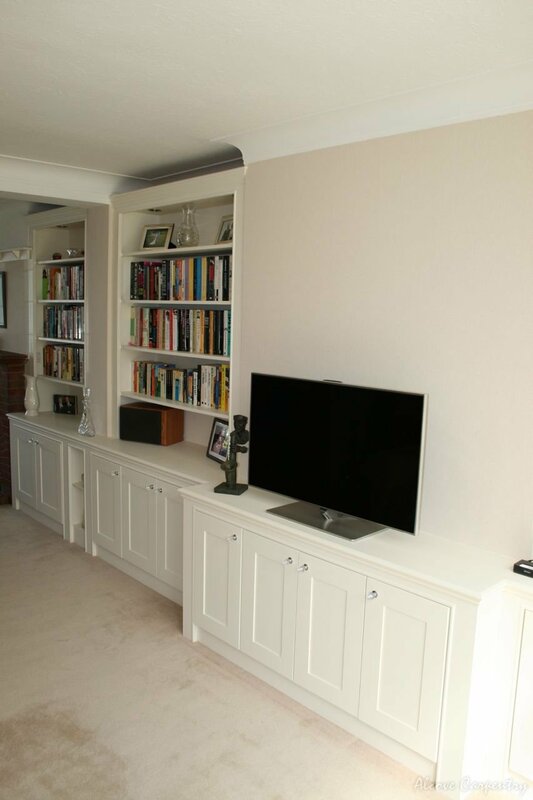 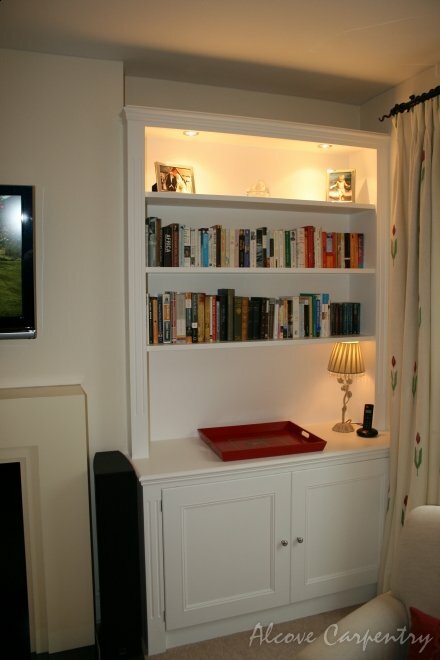 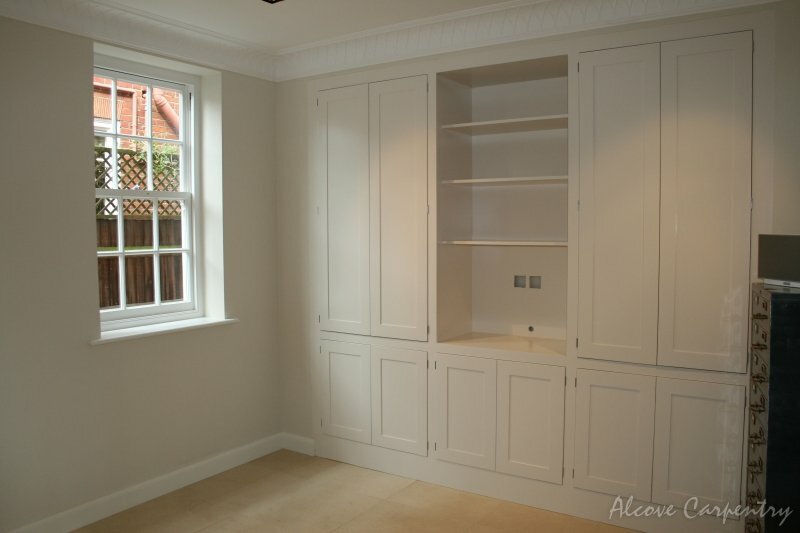 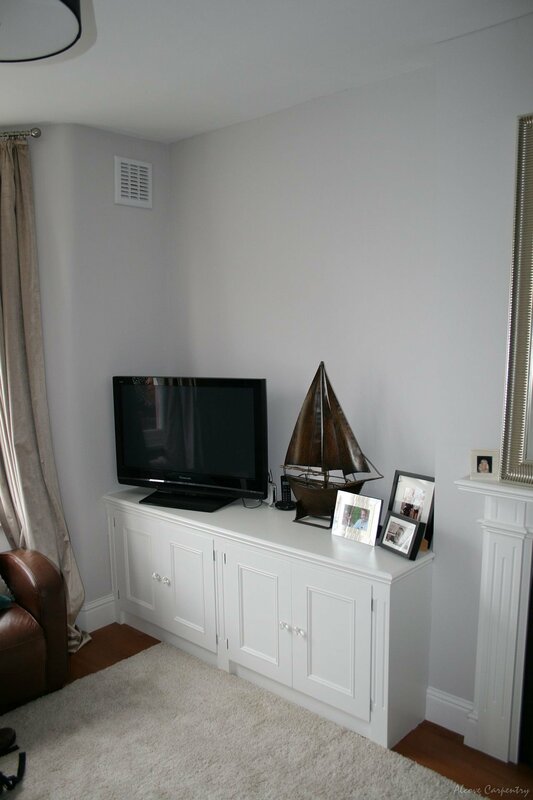 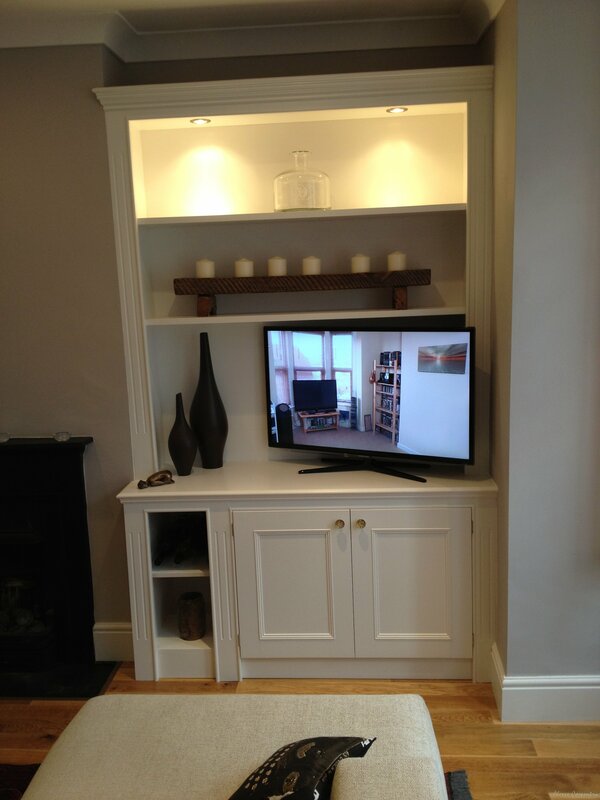 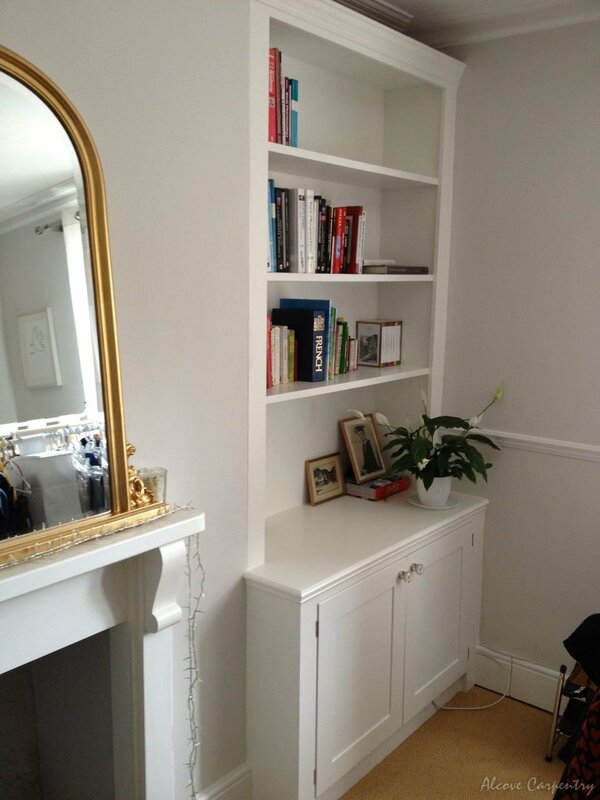 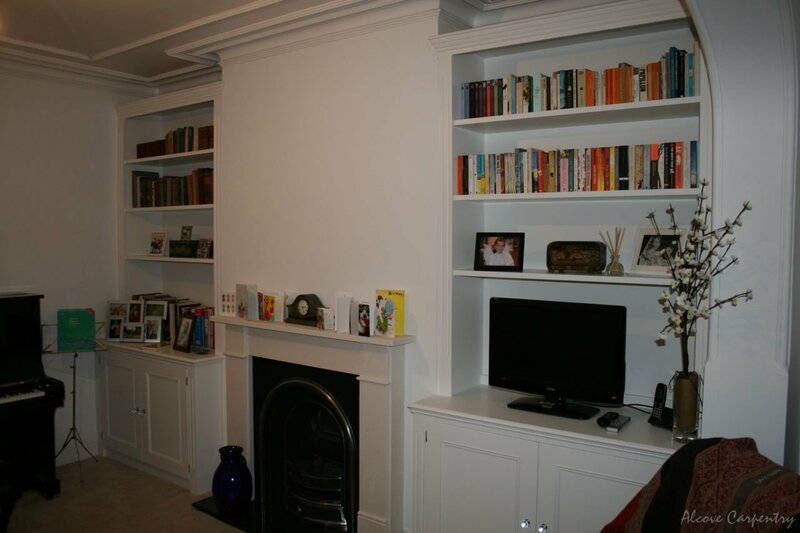 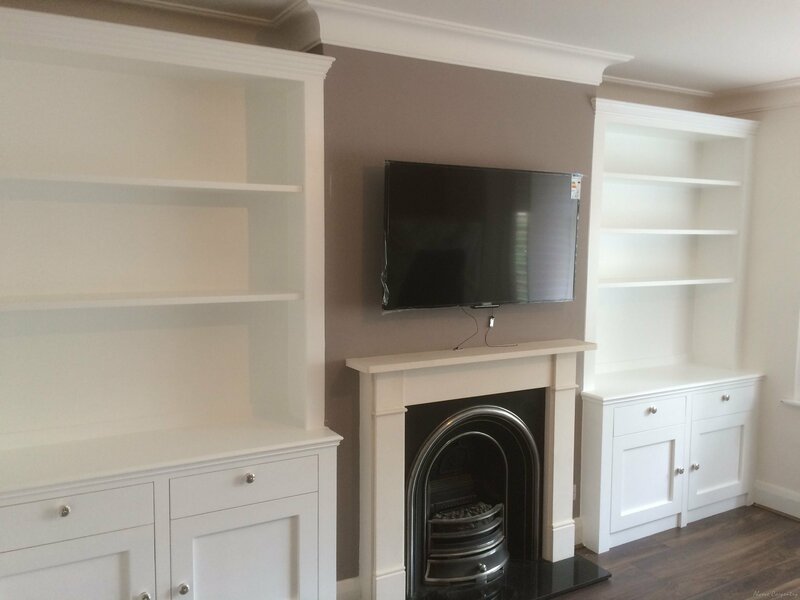 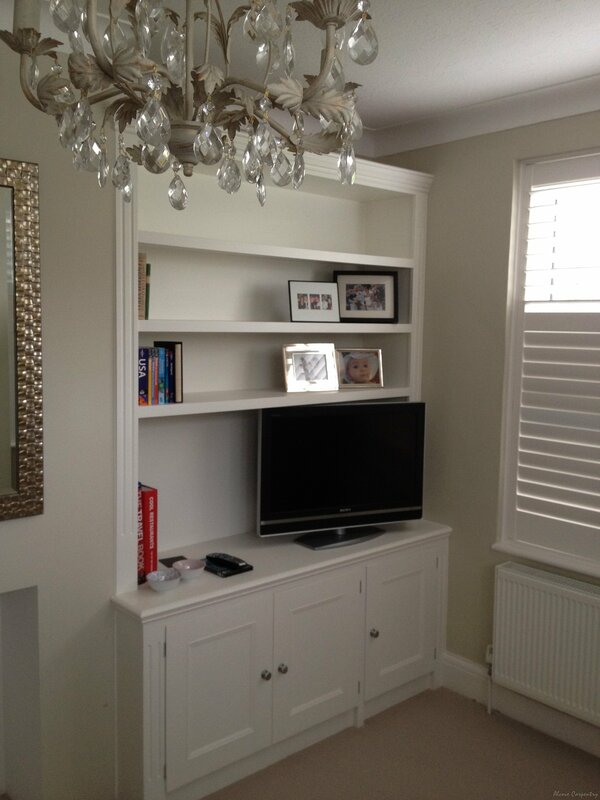 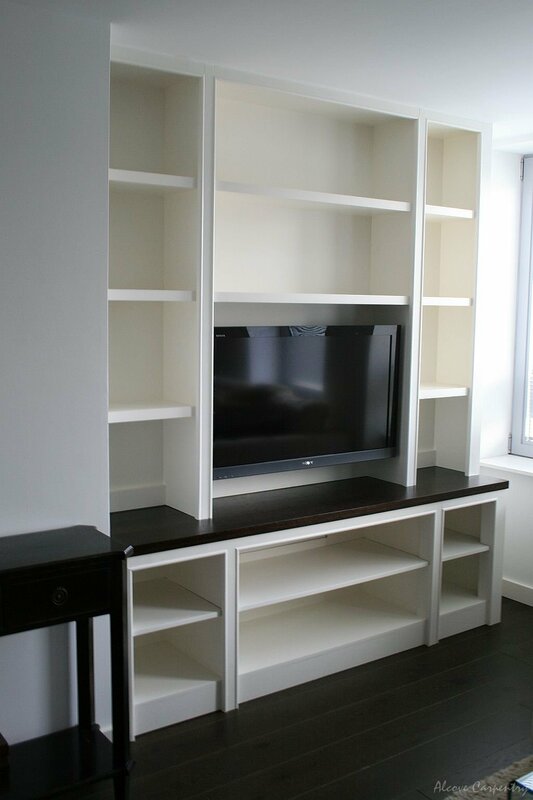 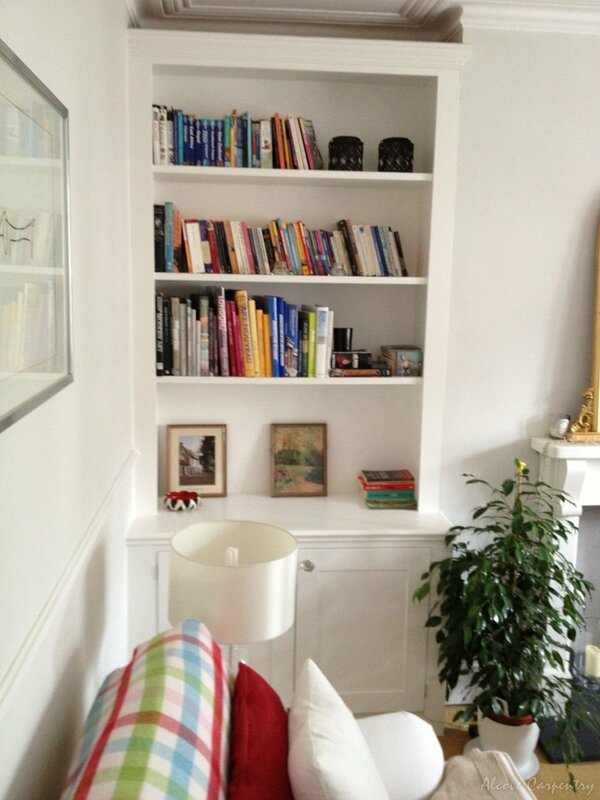 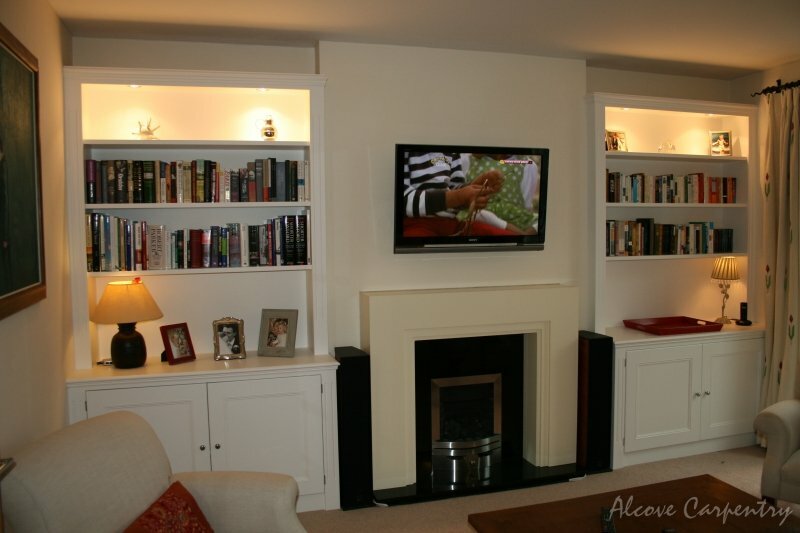 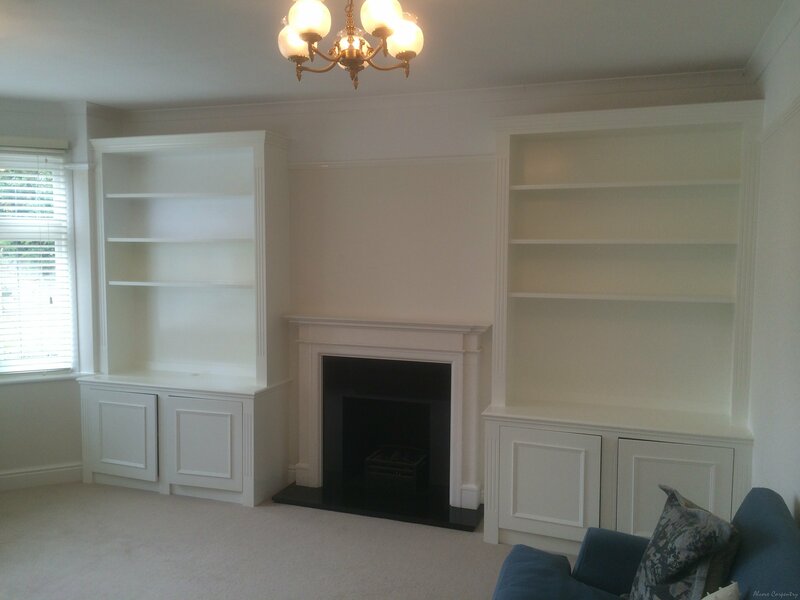 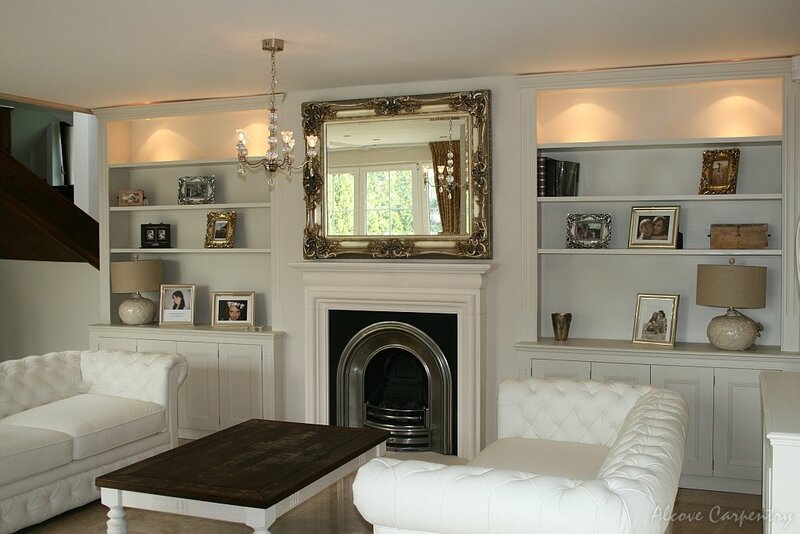 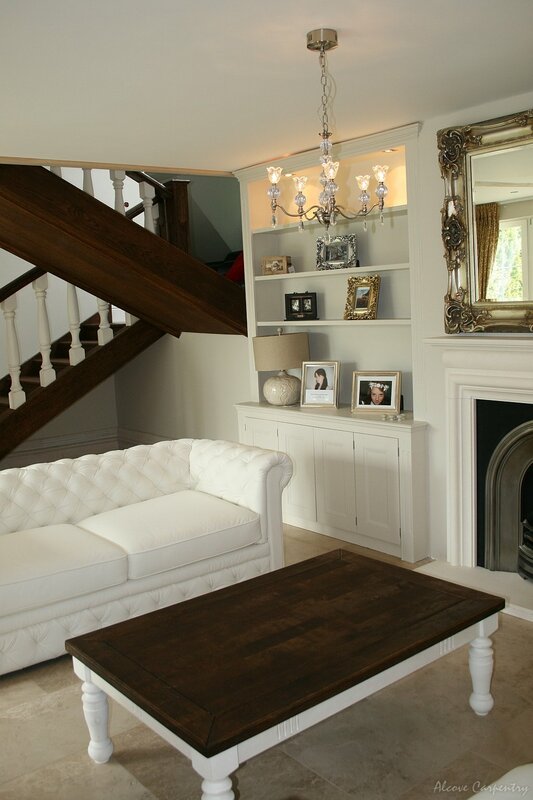 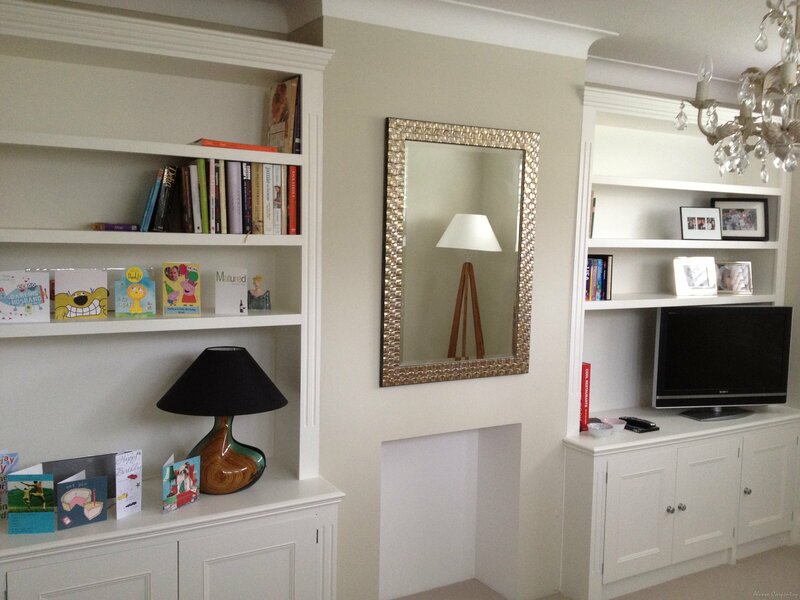 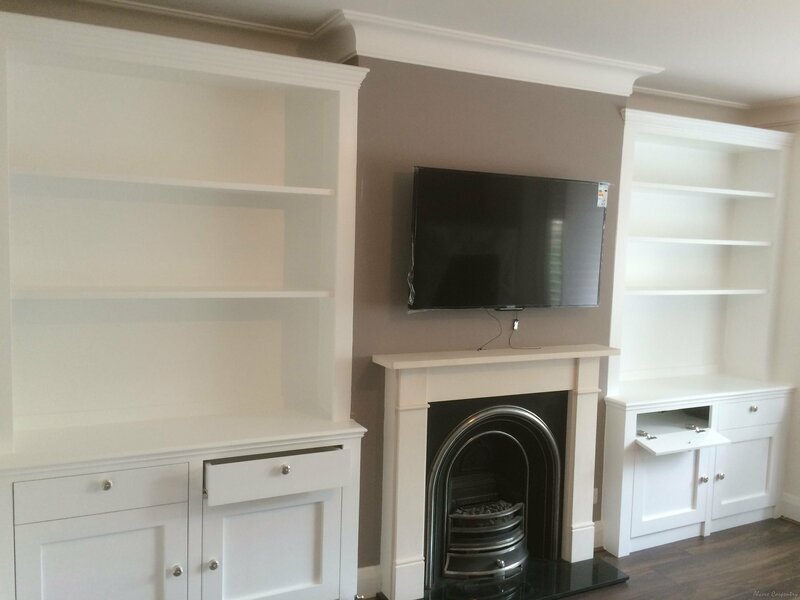 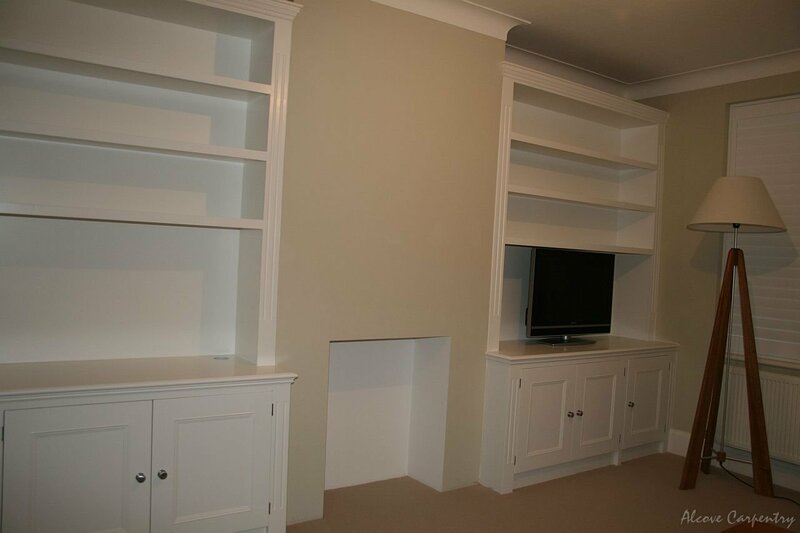 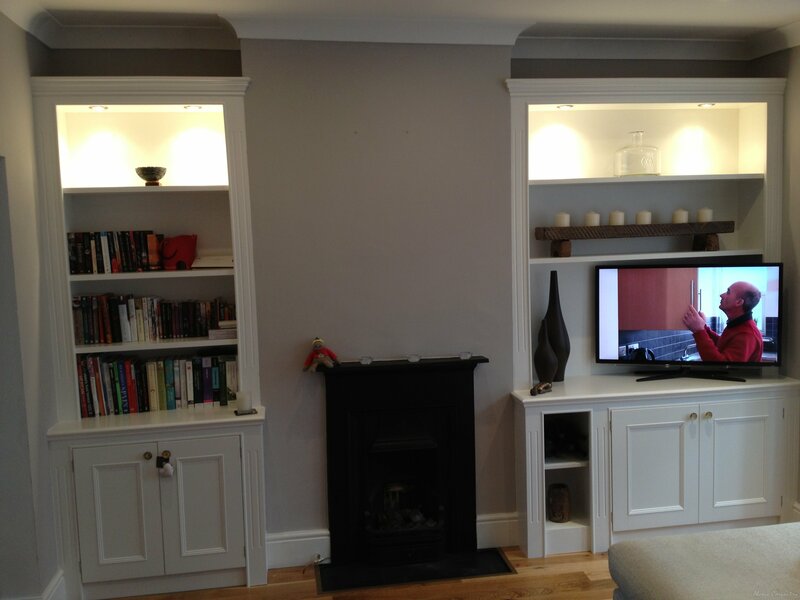 The alcove units can come in variety of white, grey, ivory and cream colours and in many soft tones. 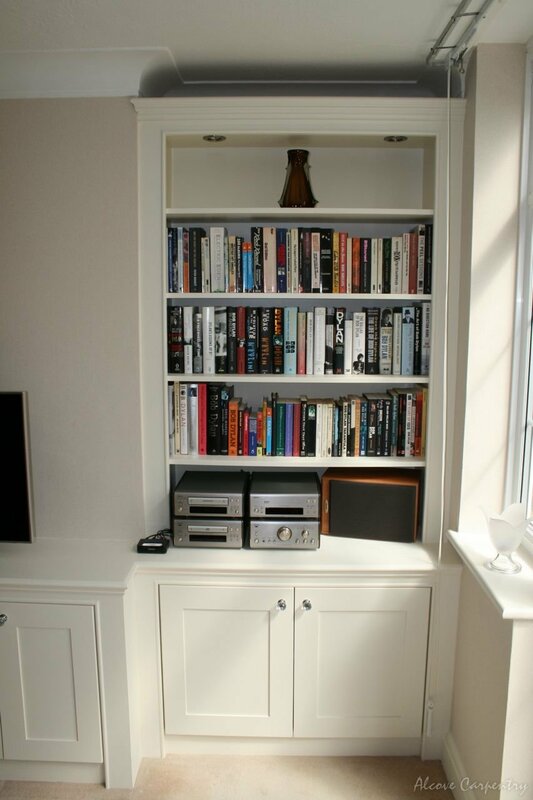 The lower part cabinets can provide good storage or great accommodation for electronic equipment. 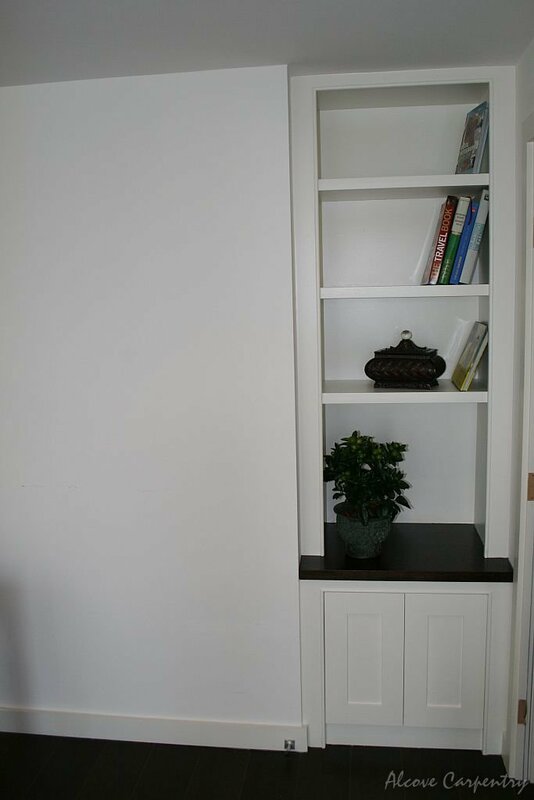 The standard dwarf unit is about 45 cm deep and about 80 cm height. 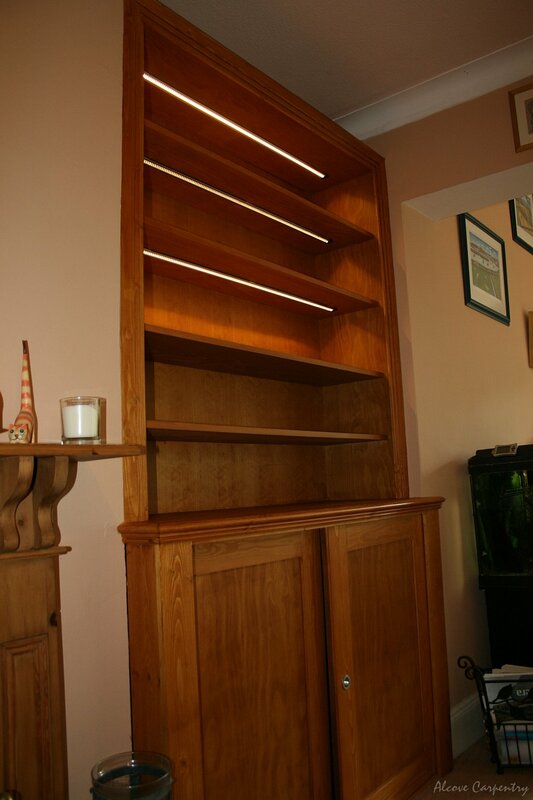 It is usually with one or two interior shelves. 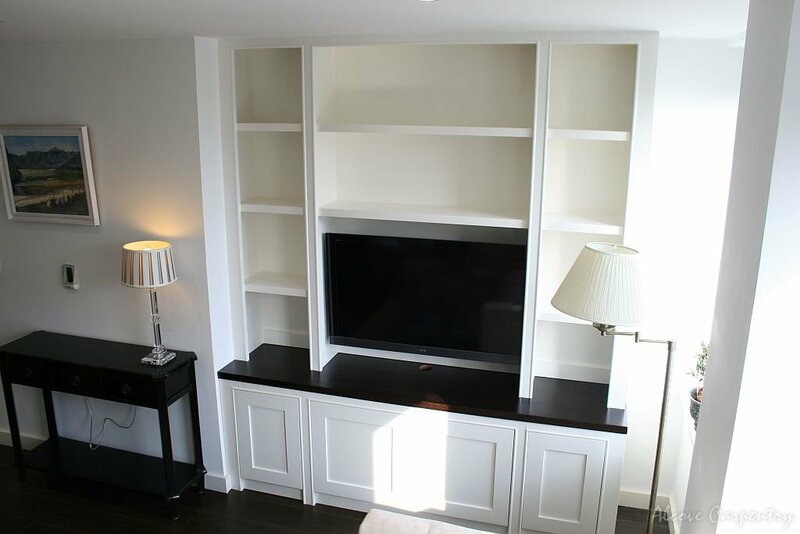 These sizes give functional space for a TV, DVD and any game box or music equipment. 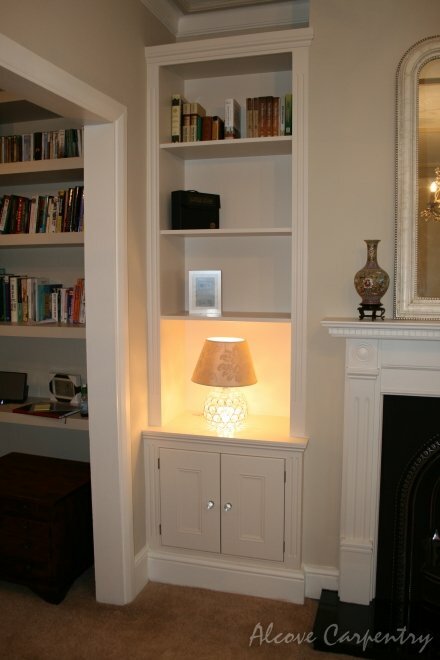 The top of the cupboard can be use for TV or some decorative lamps. 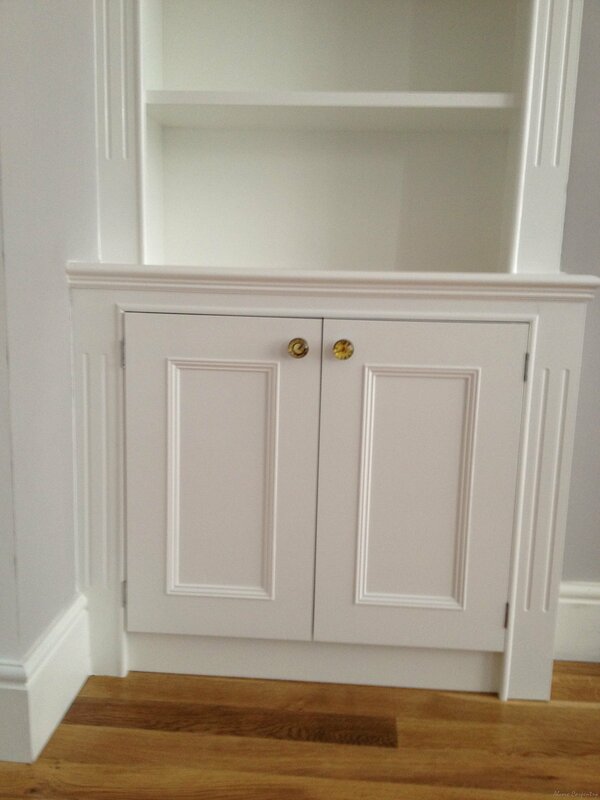 The base unit can have protrude or recess plinth. 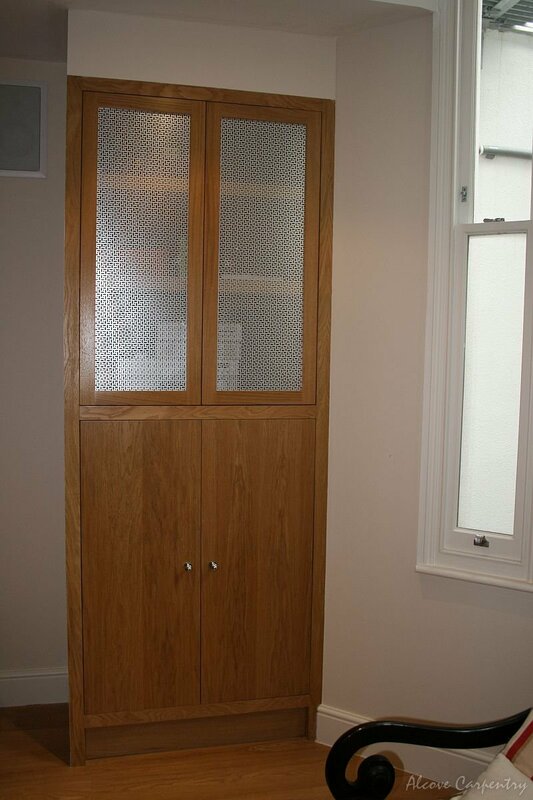 The doors can be installed on traditional or concealed hinges. 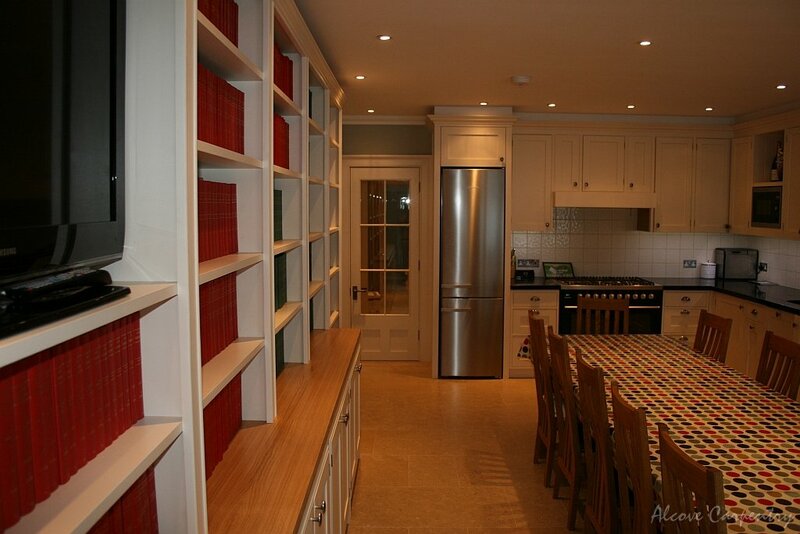 We offer the variation of worktop finishes depends on your preferable style. 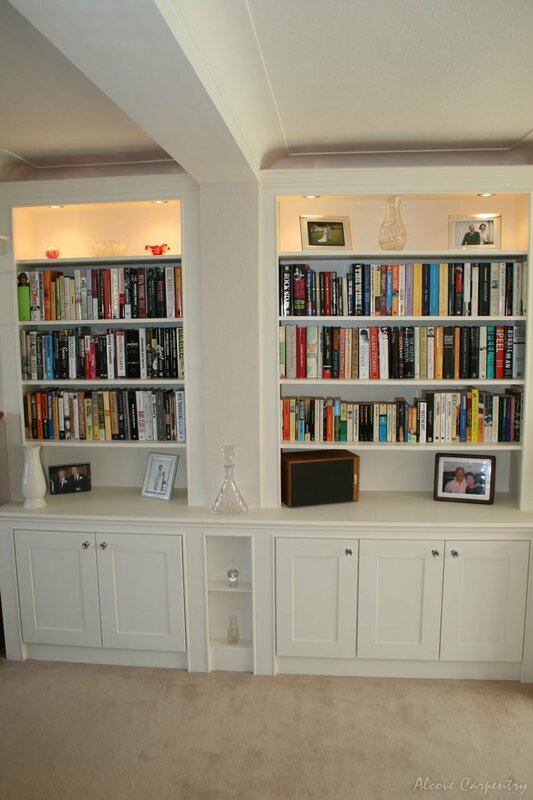 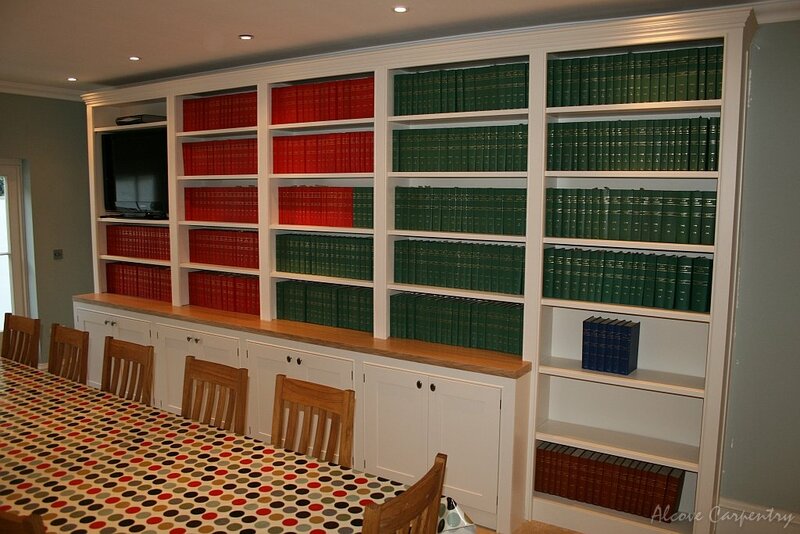 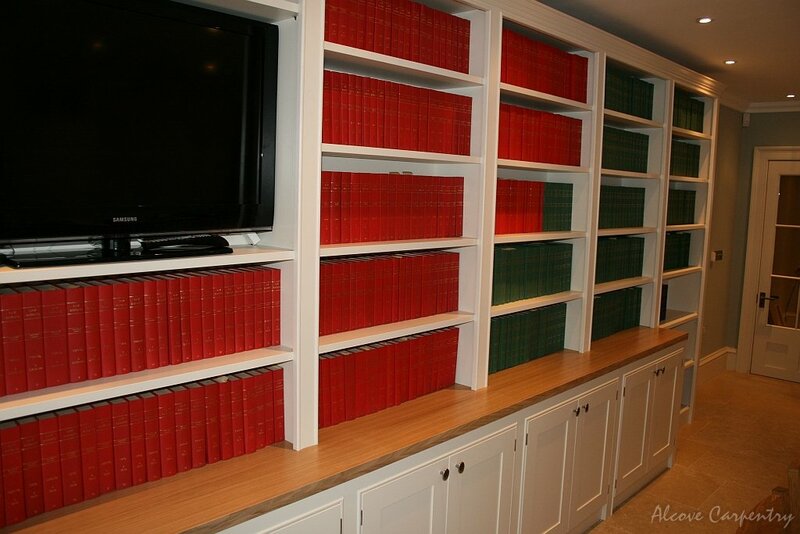 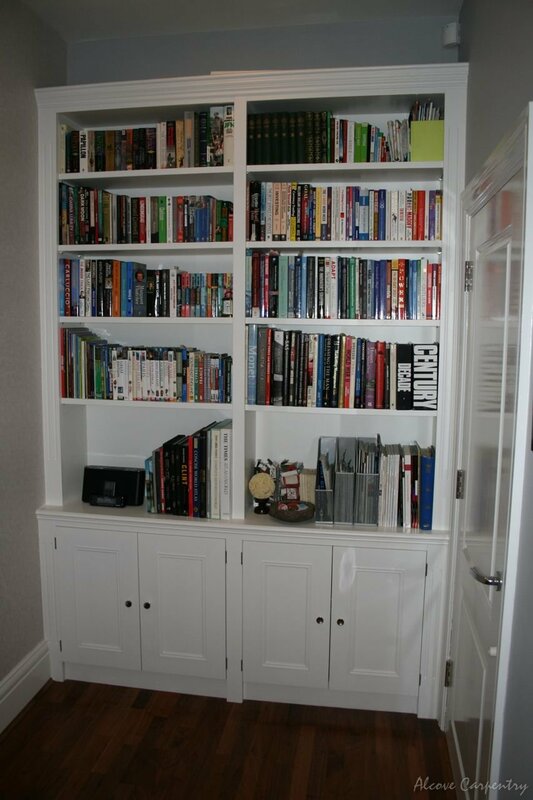 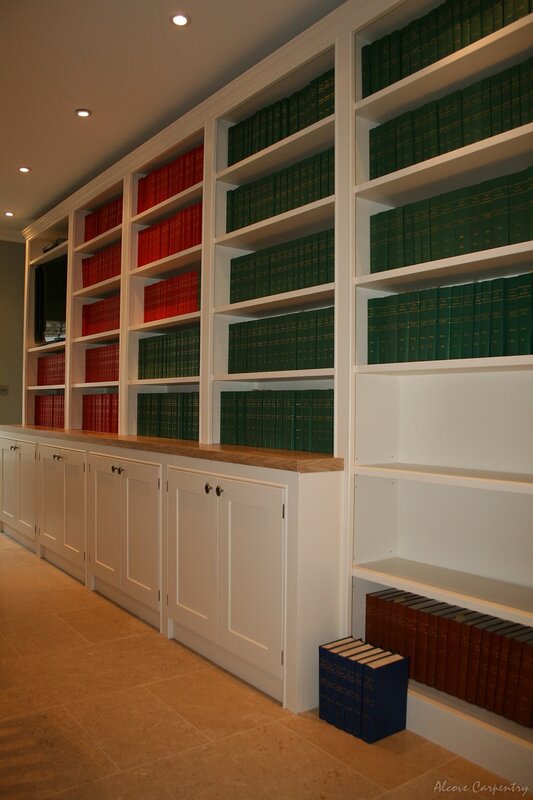 The upper part bookcases are not only for books. 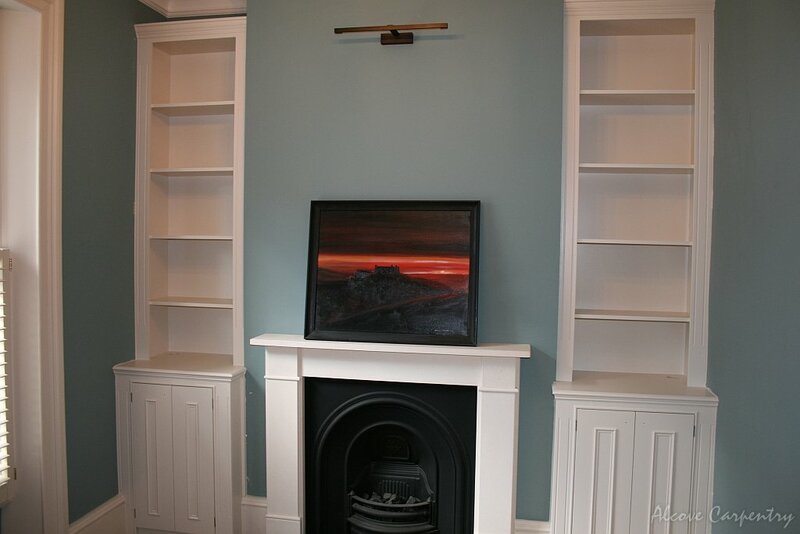 They can also be a great place for displaying photos or souvenirs. 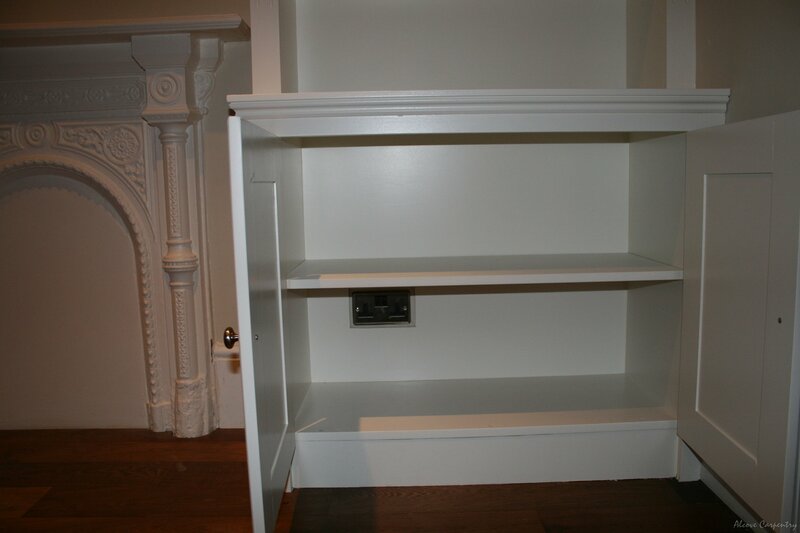 The standard size unit has three shelves above the cabinet. 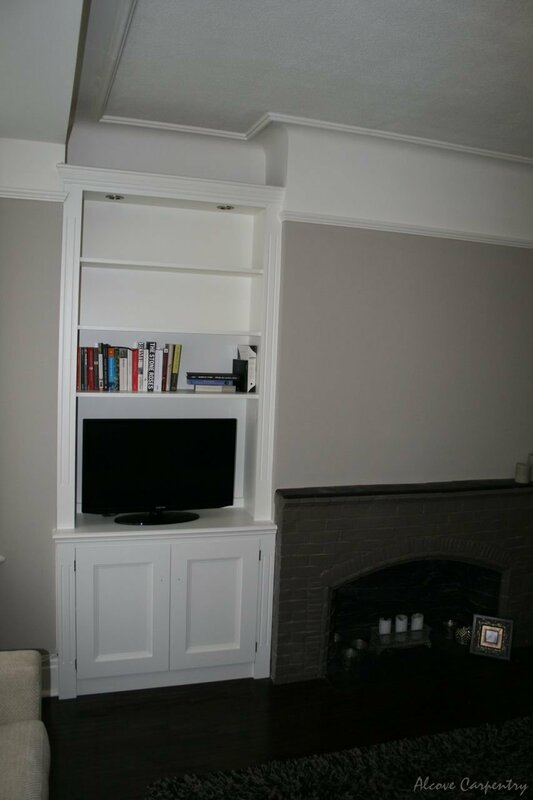 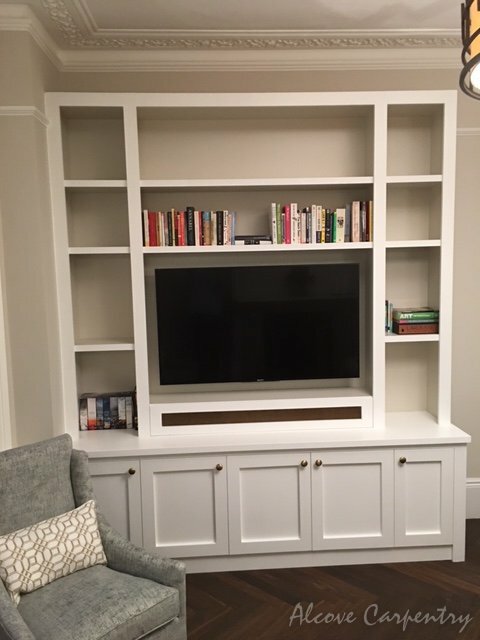 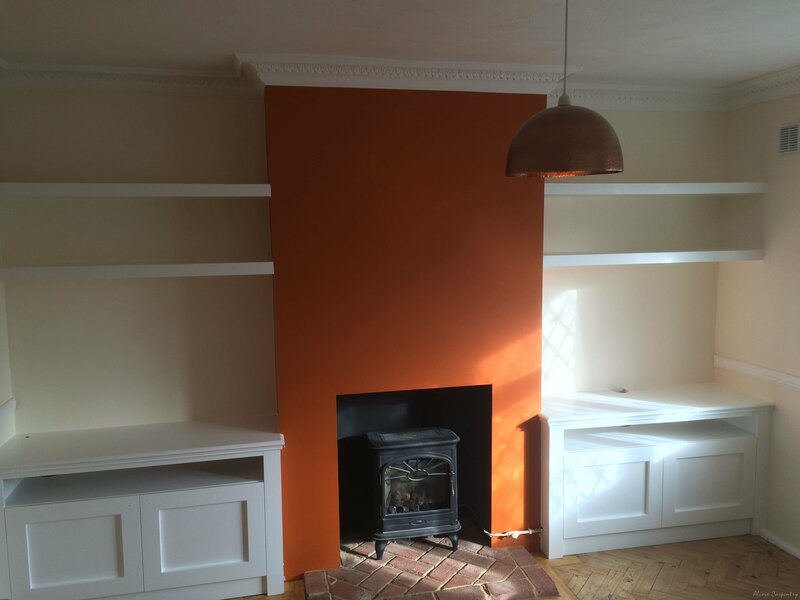 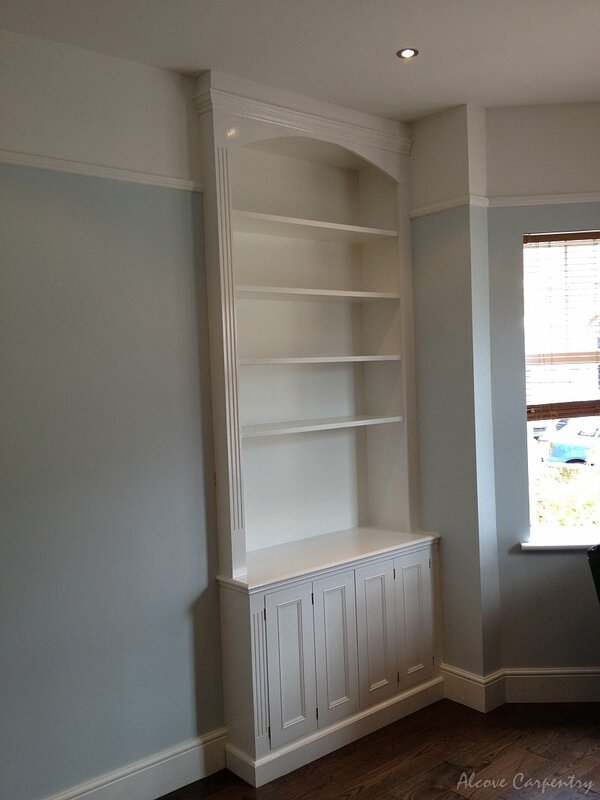 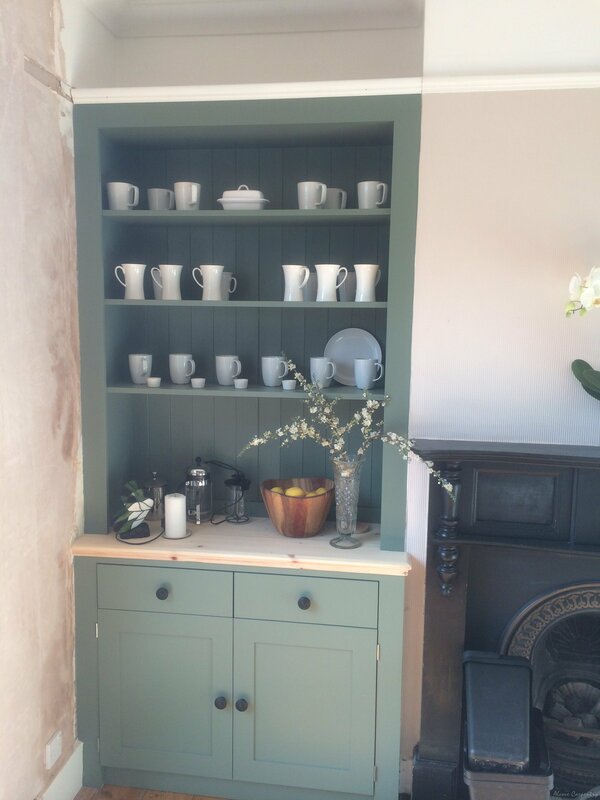 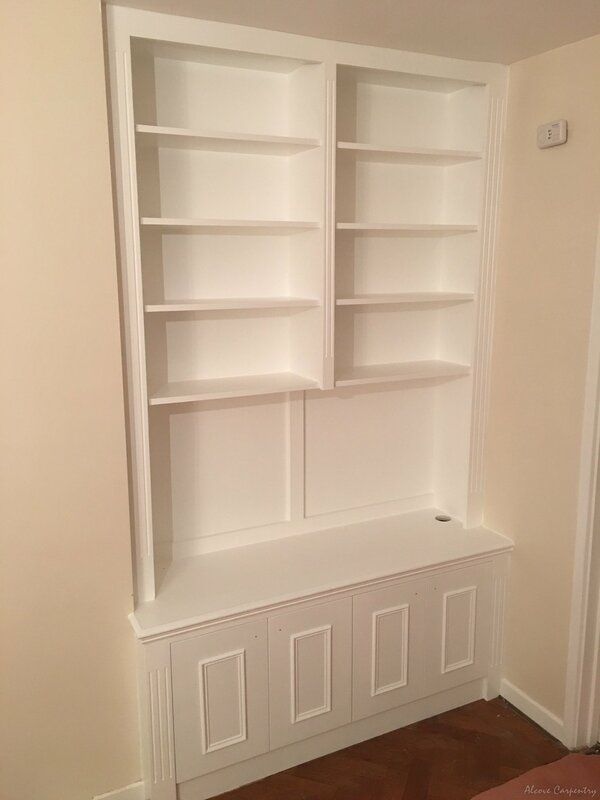 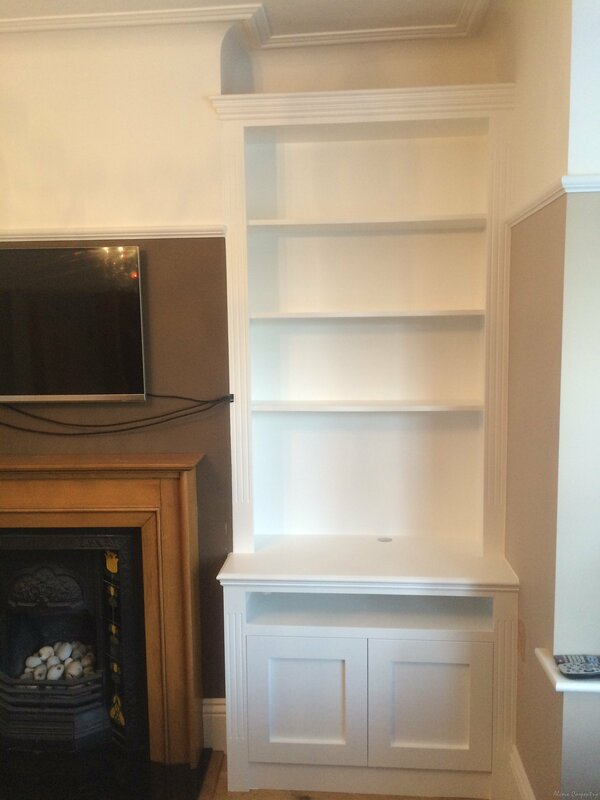 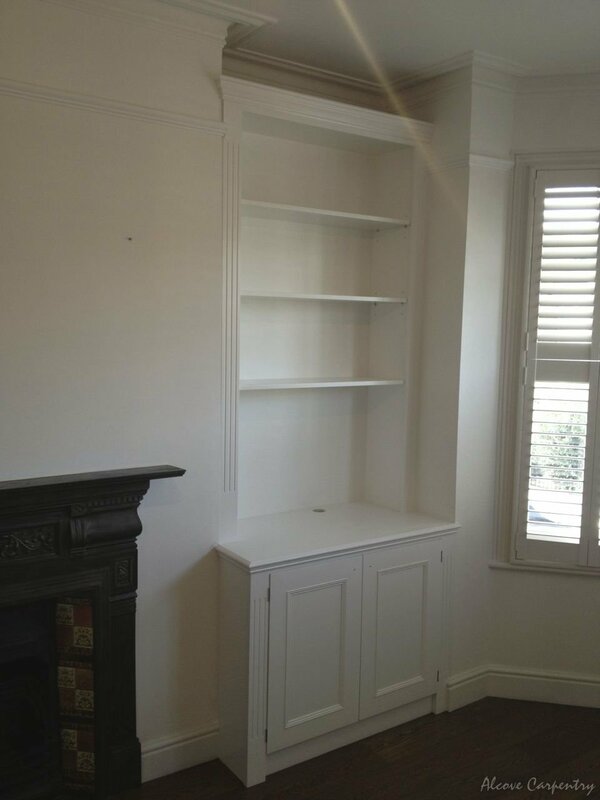 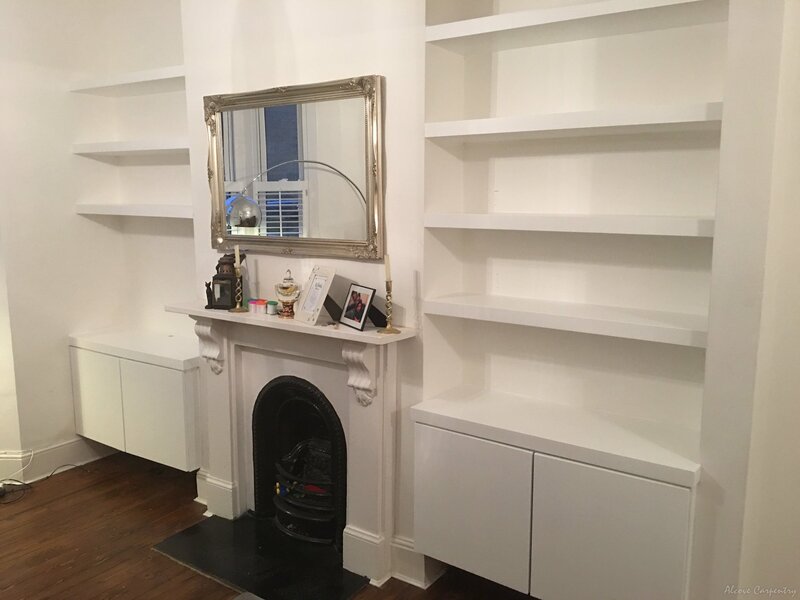 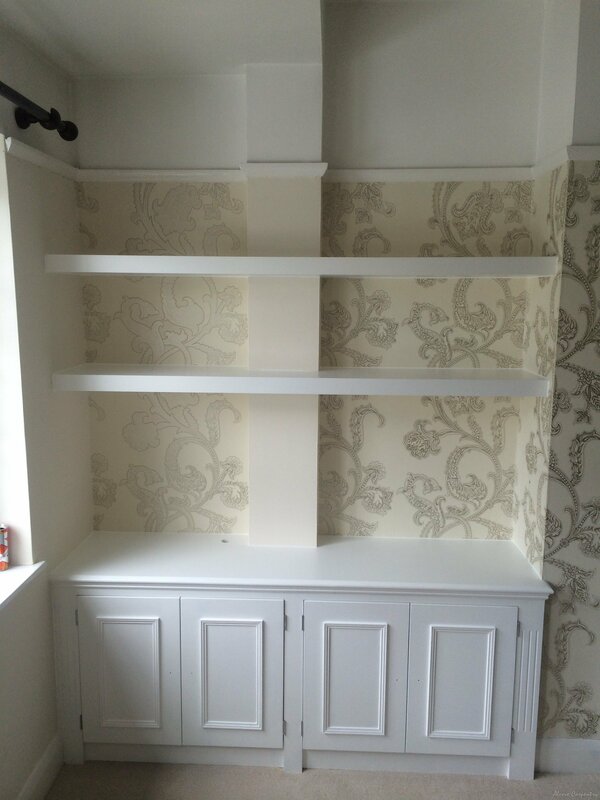 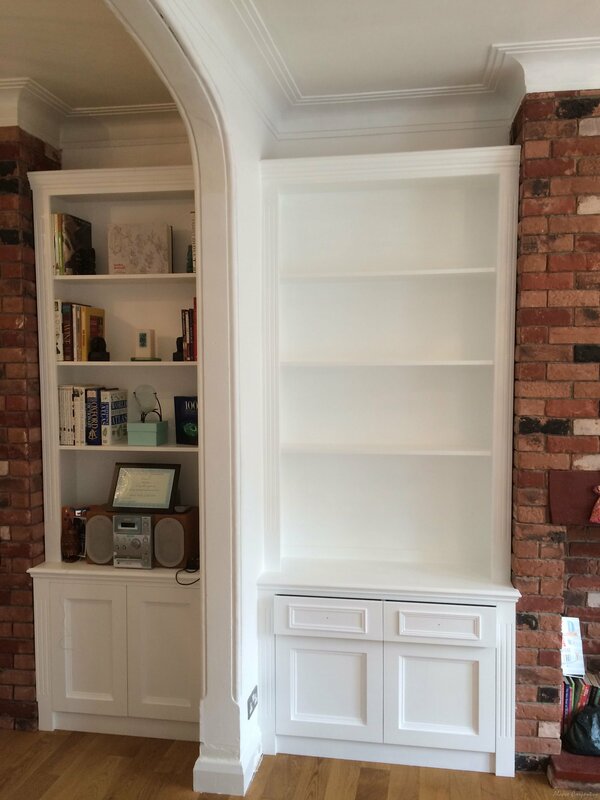 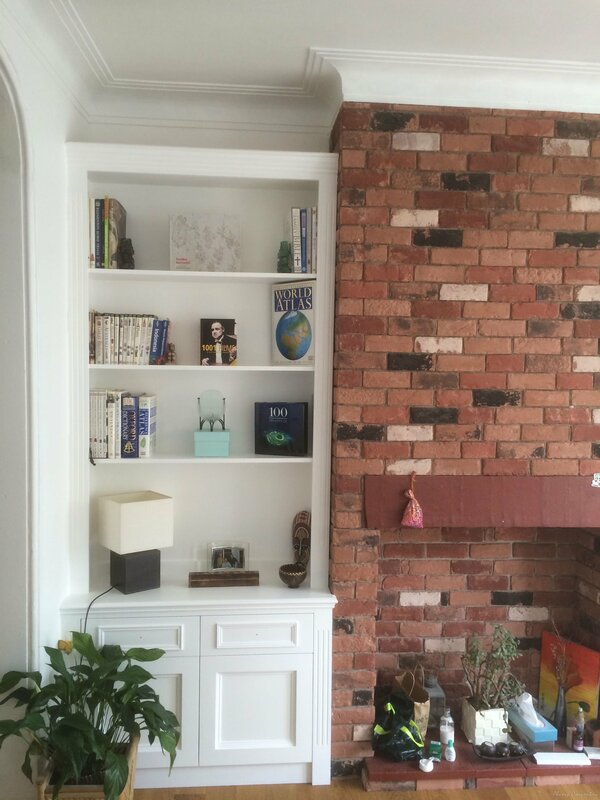 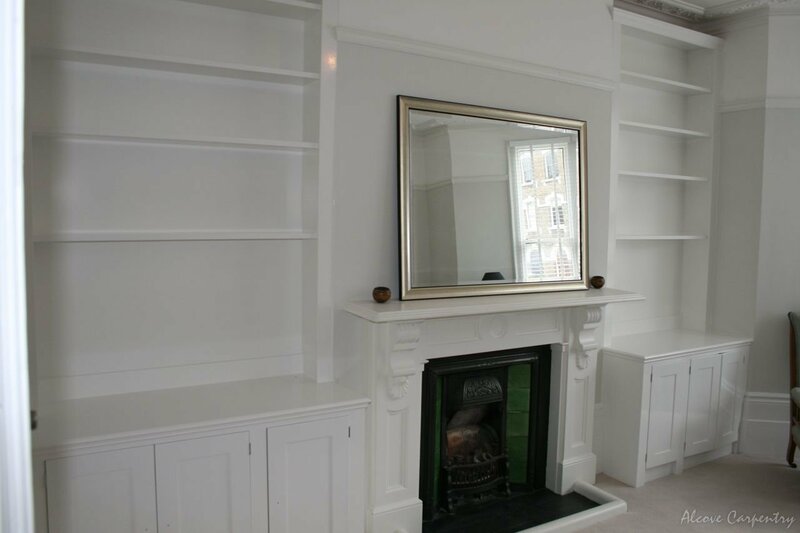 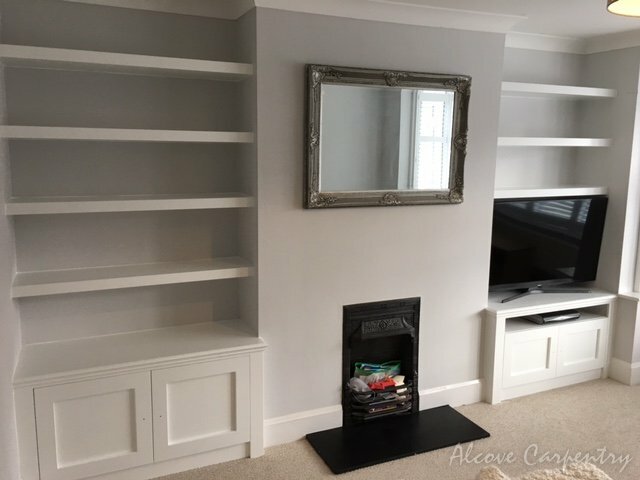 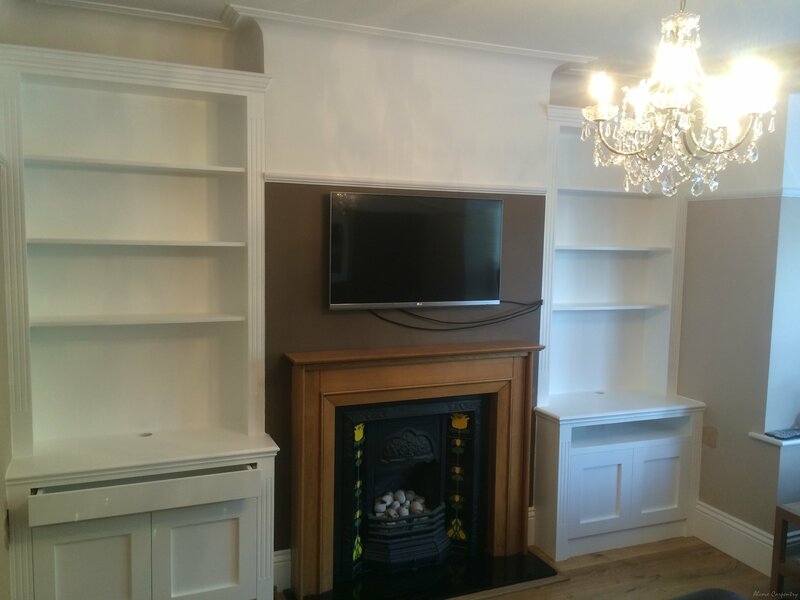 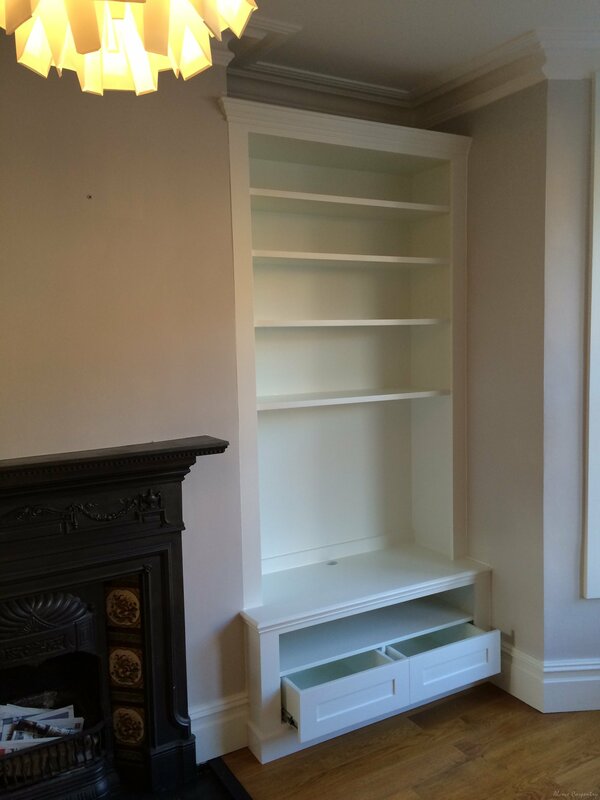 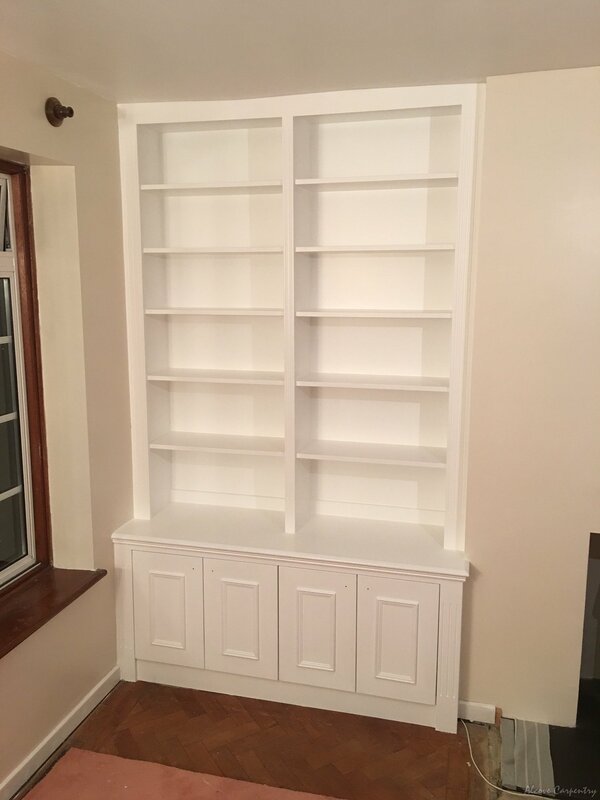 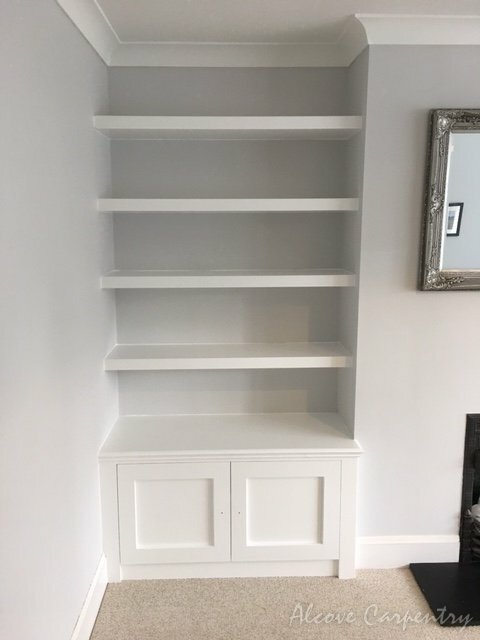 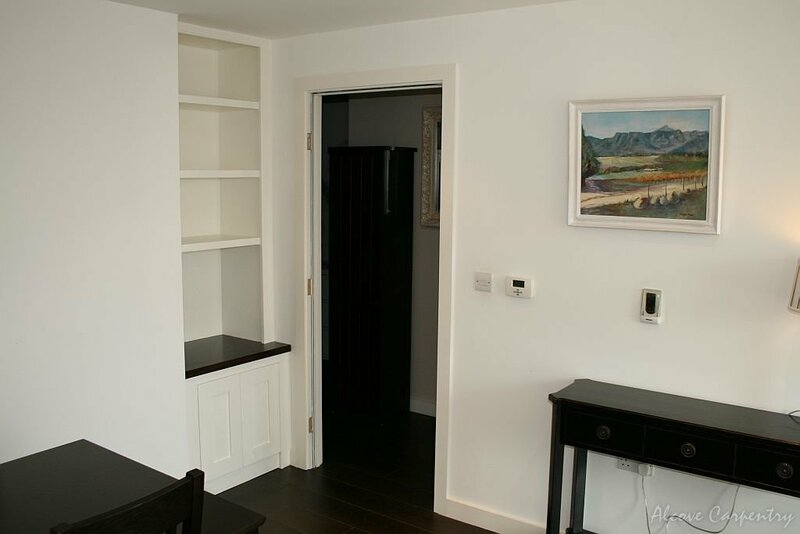 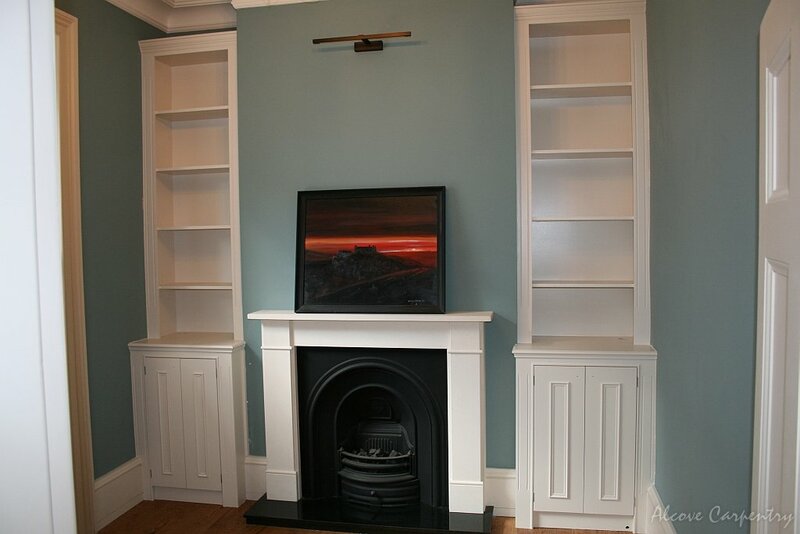 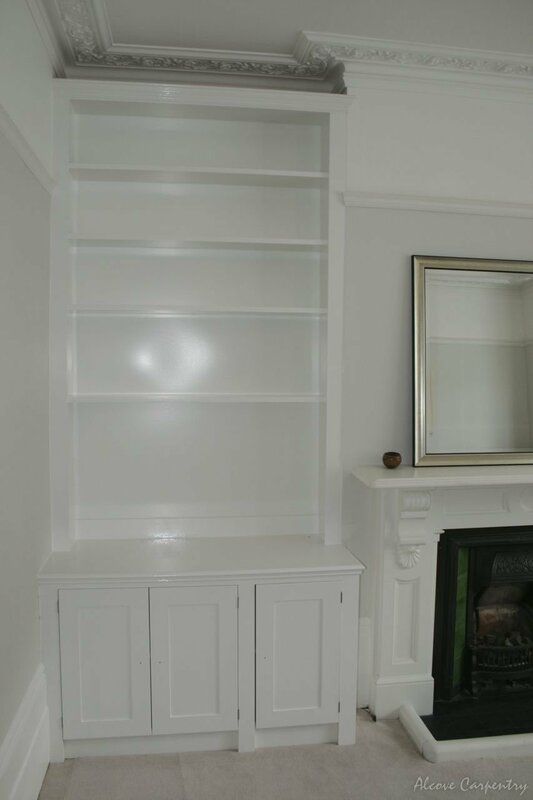 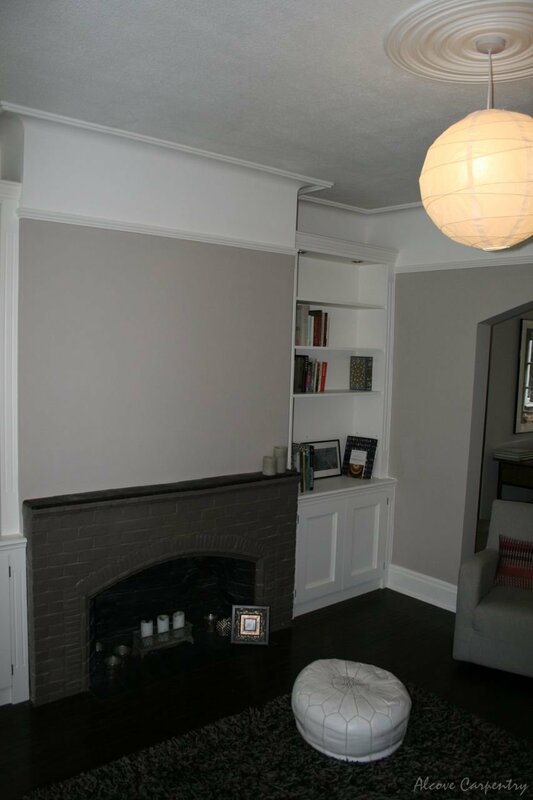 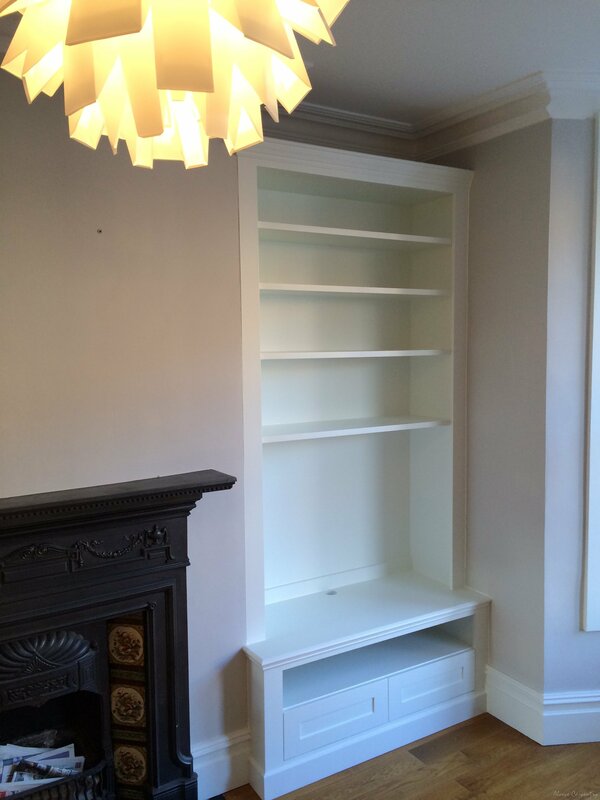 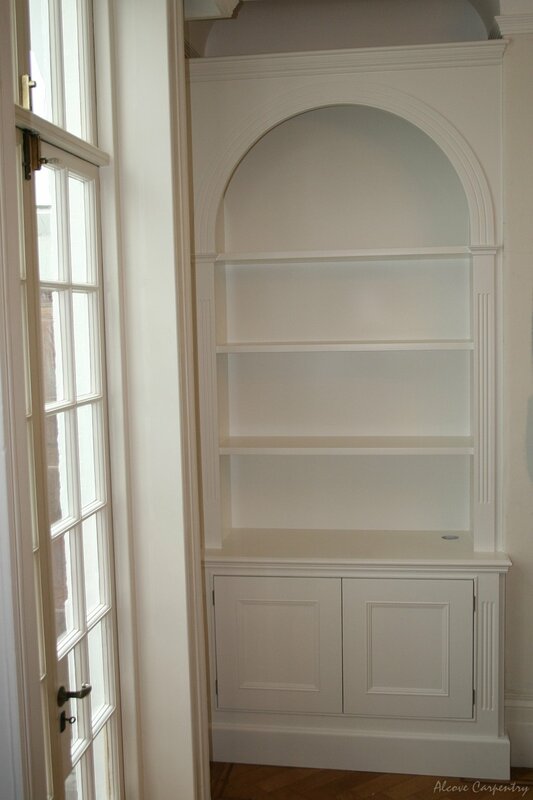 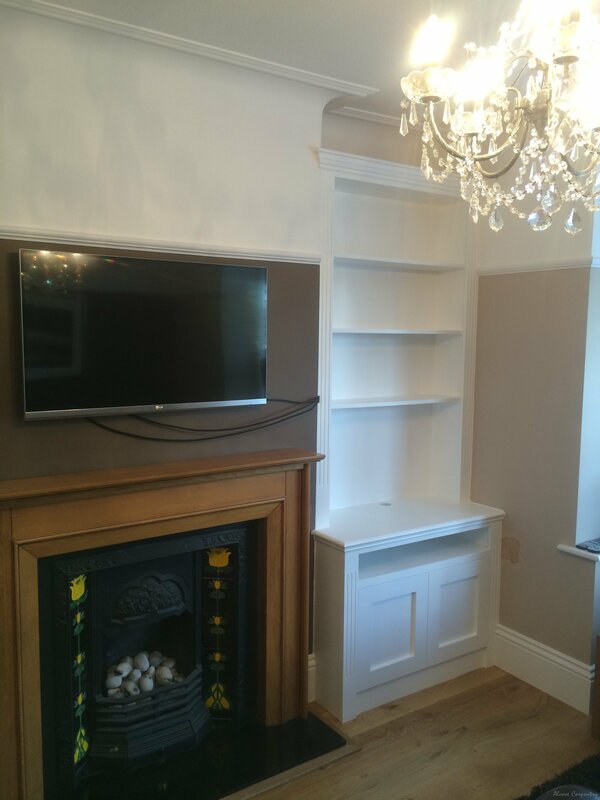 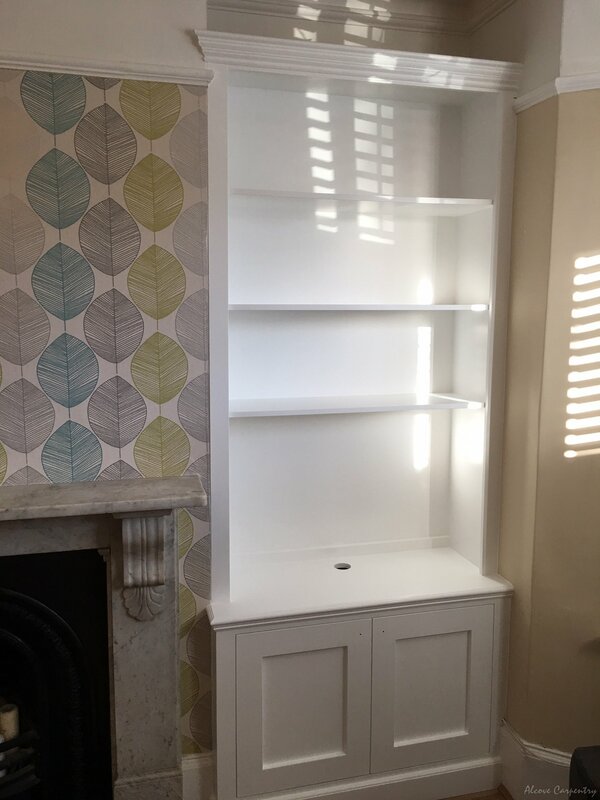 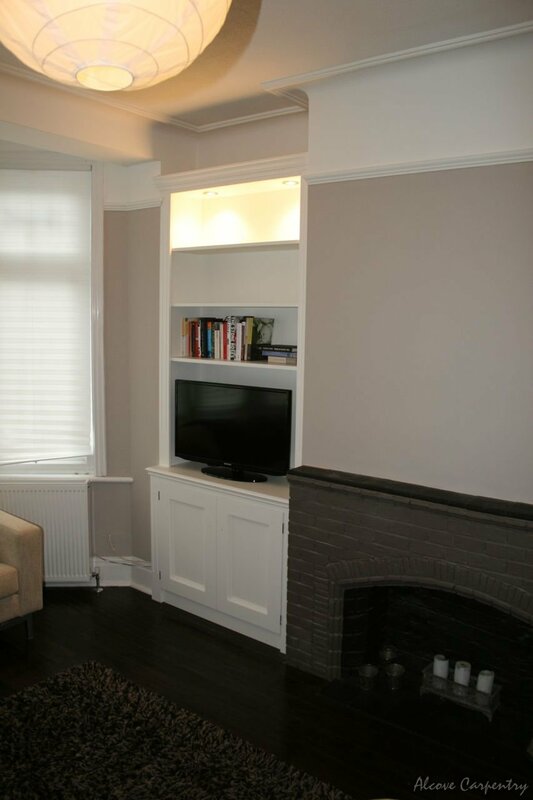 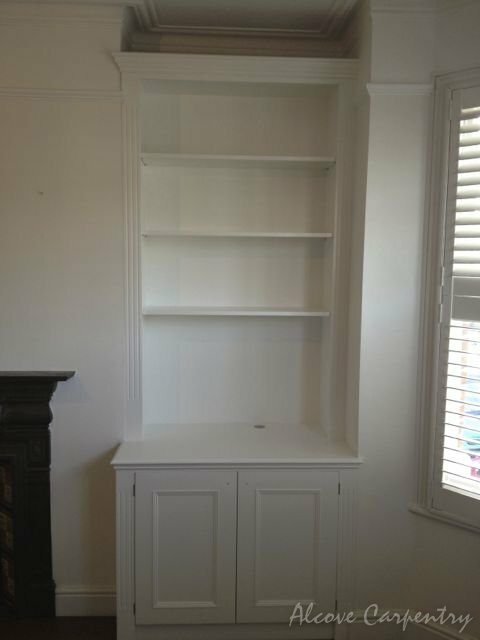 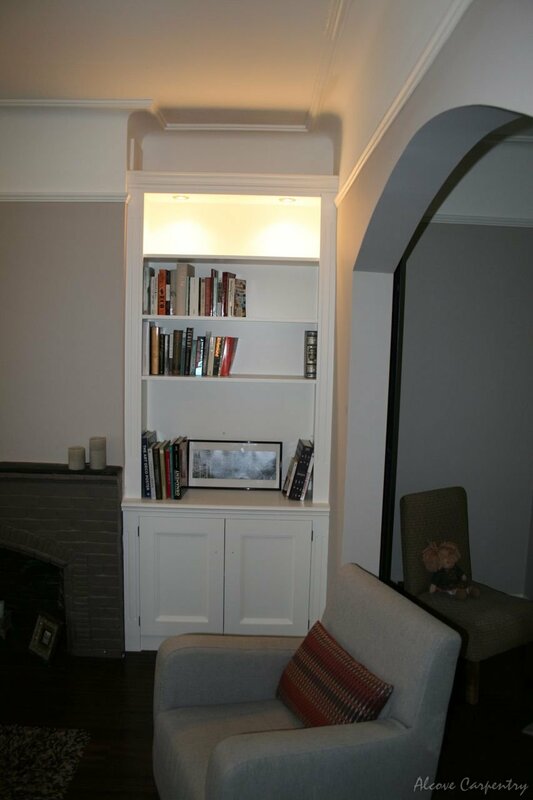 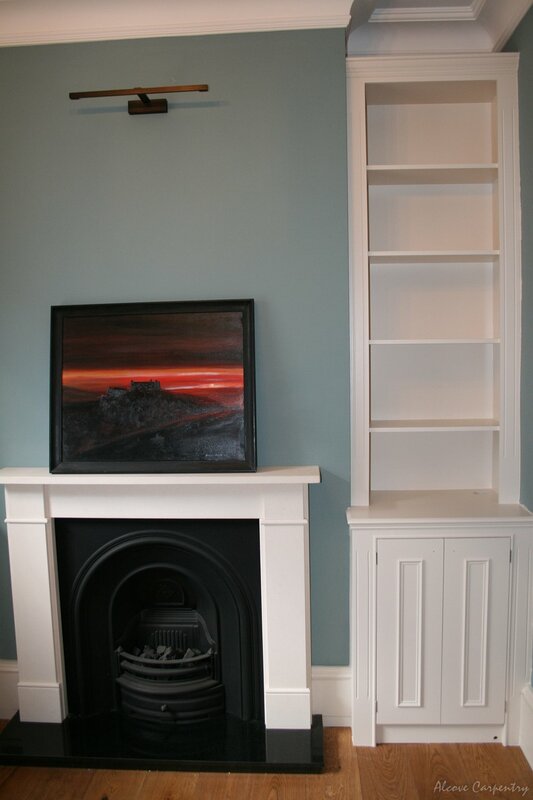 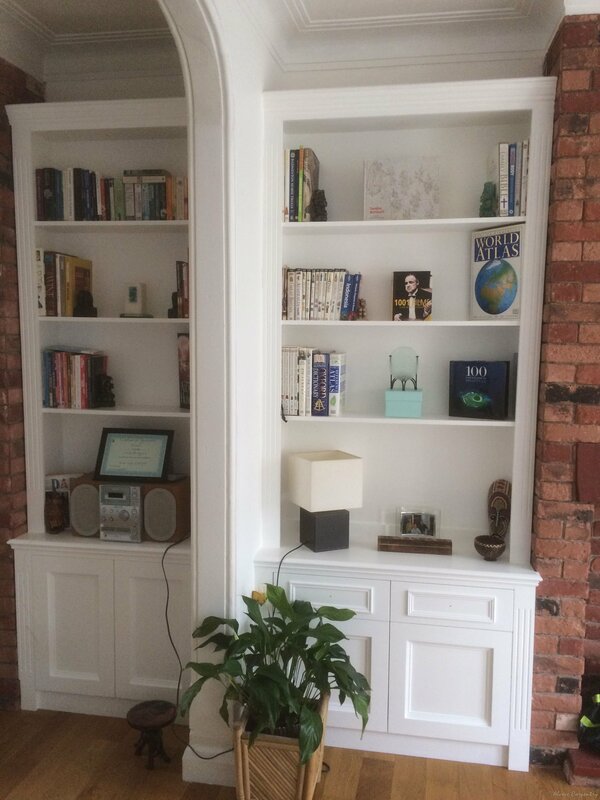 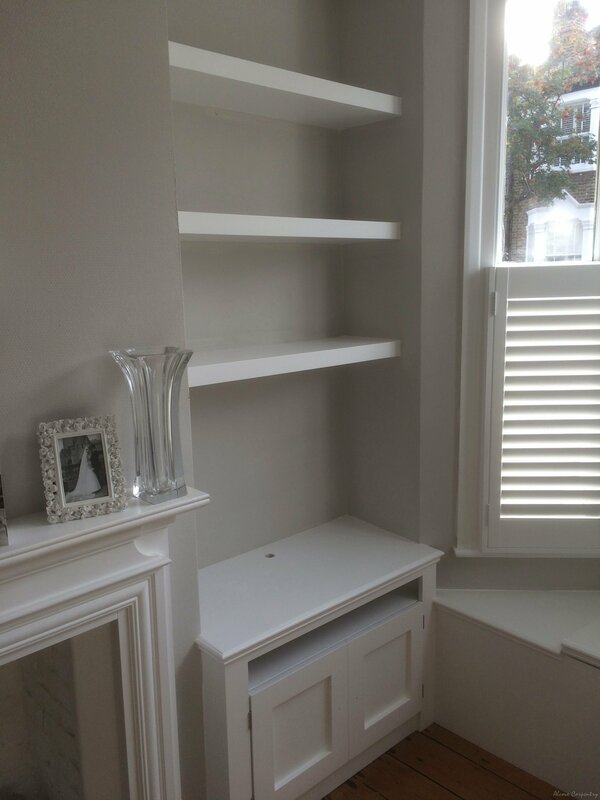 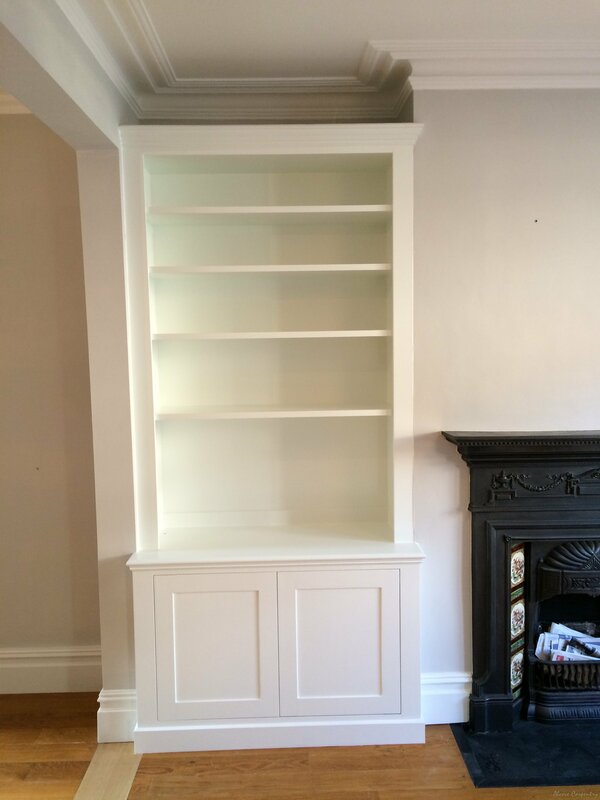 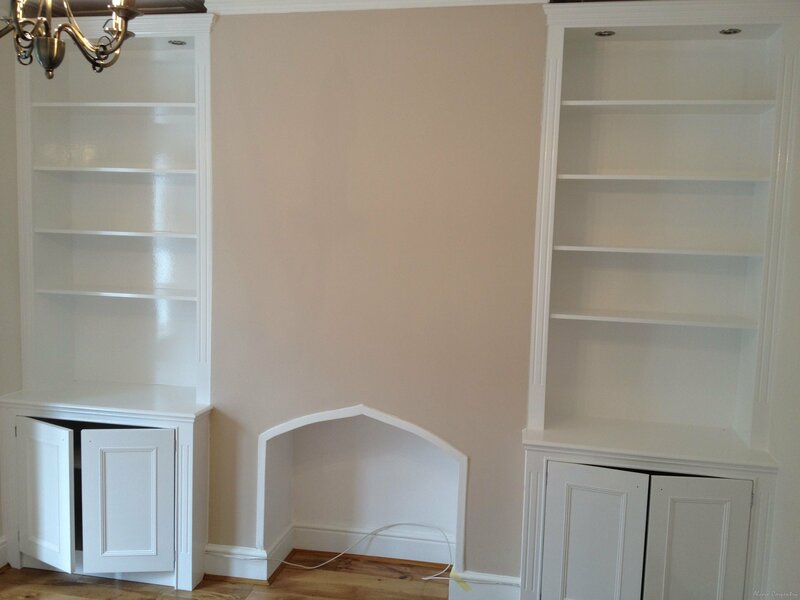 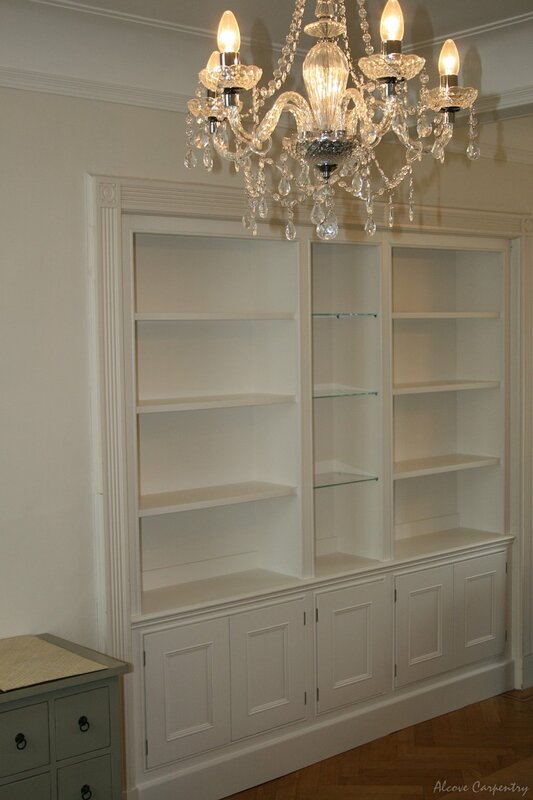 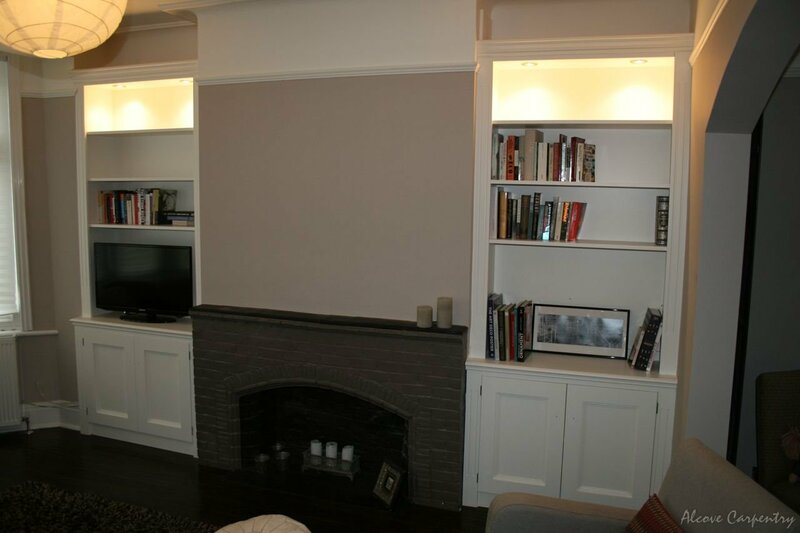 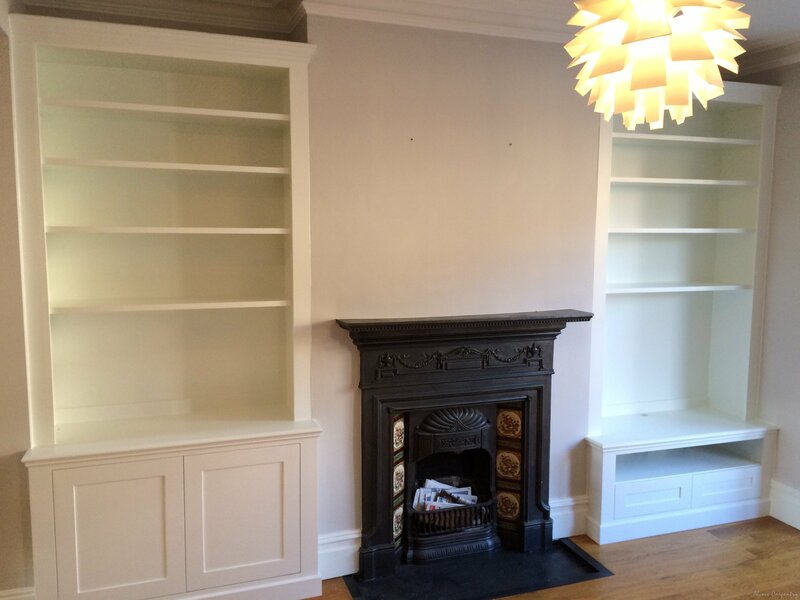 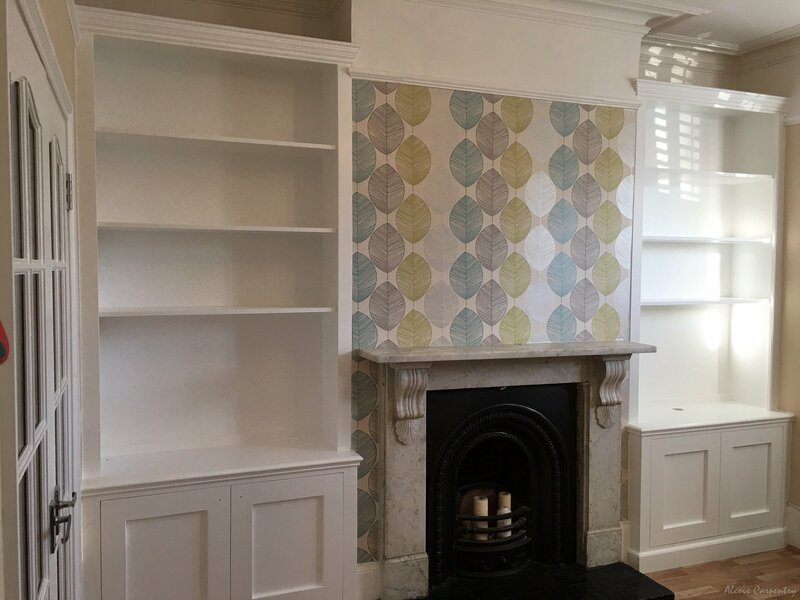 The top of the shelving part is finished with the coving.This part of the alcove unit can have the top lighting and lit the room to create a special atmosphere. 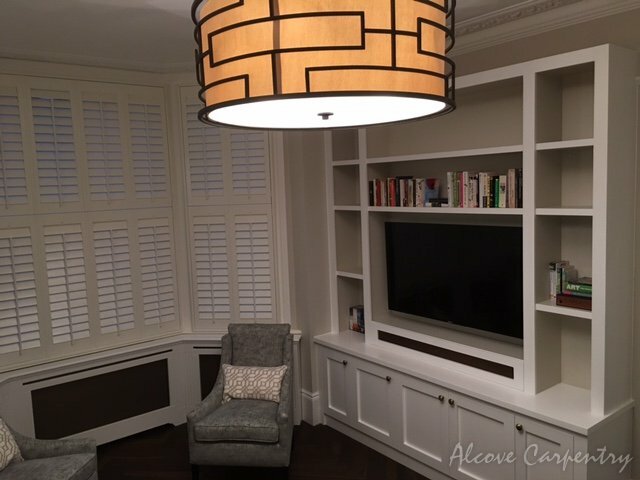 The details of the alcove units like fluted panels with ornamental vertical groves, cornices or door ornamental mouldings give them a characteristic traditional style.